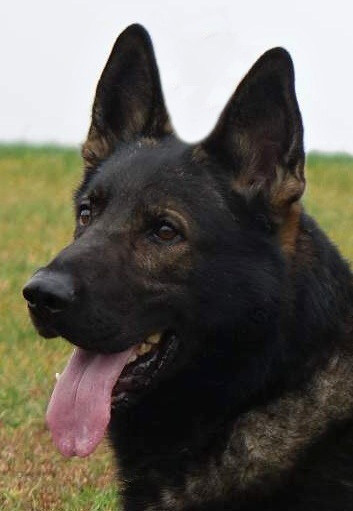 GAO belongs from his sire KENN Jipo Me's side to the 2nd blood line namely to the world renowned working branch founded by FERO v. d. Zeuterner Himmelreich. 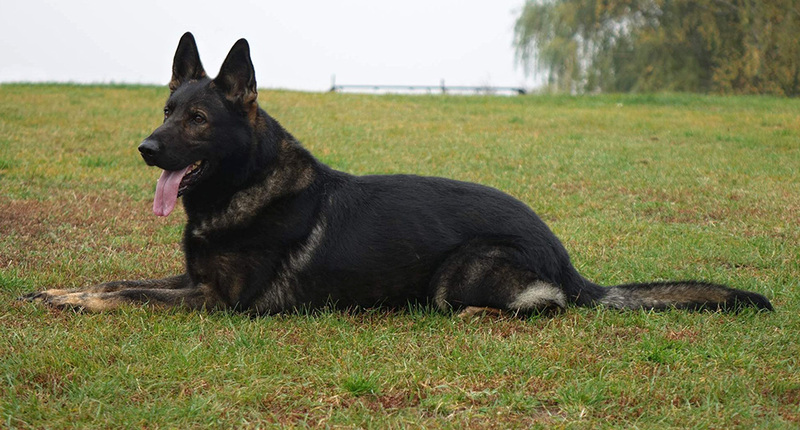 FERO is a famous producer of wide range of dogs that competed at WUSV World Championships. 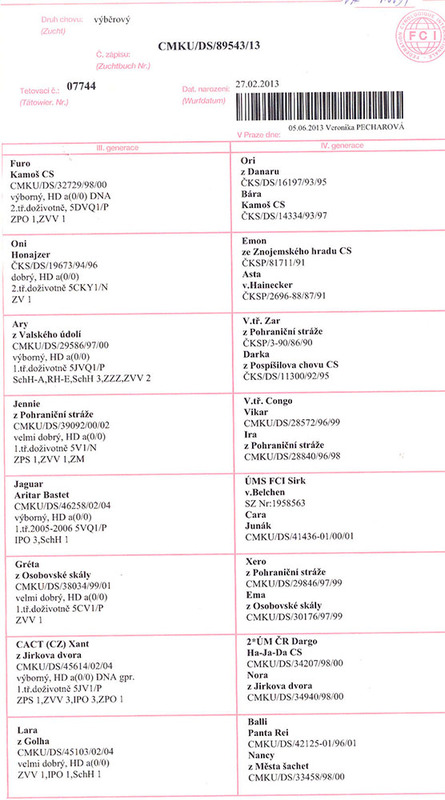 Only few West European dogs at World Championship don't have FERO somewhere in their pedigree. 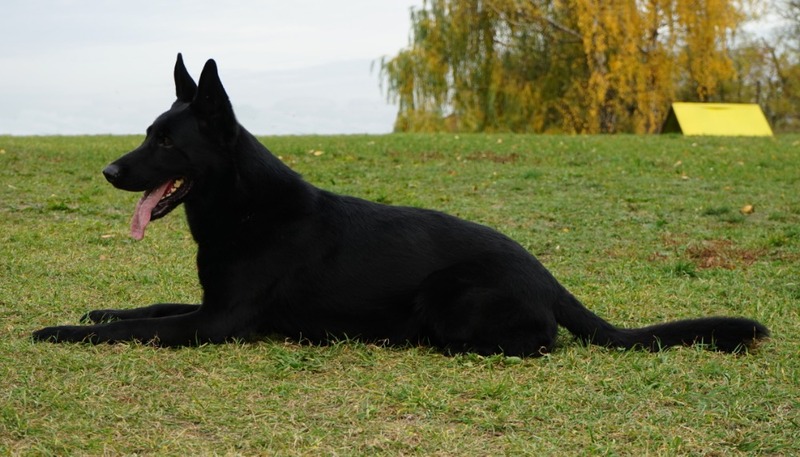 These dogs are known for their strong bones, dark pigmentation, ability to start working quickly, their speed and hardness in protection. 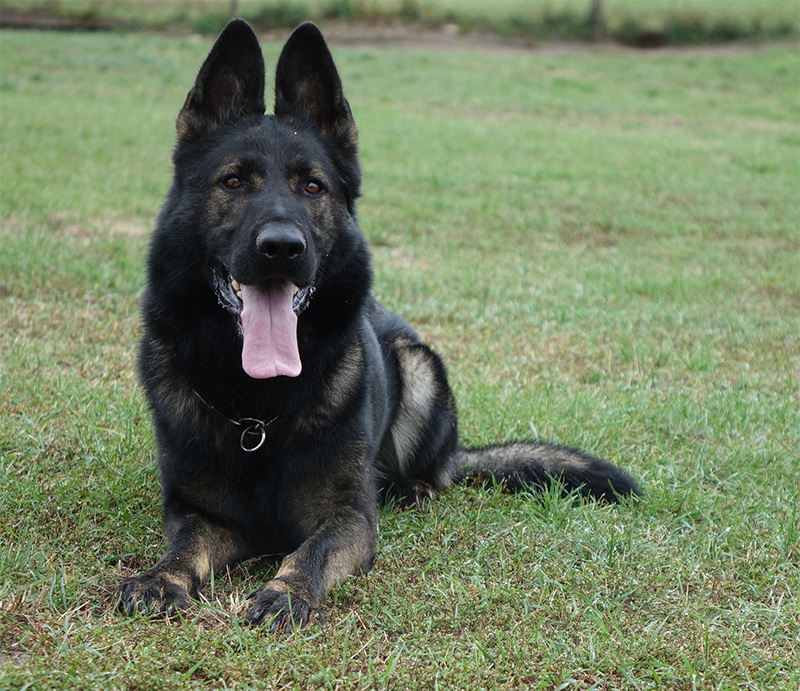 Another of their assets is that they are able to swith off after the training and rest and focus on their upcoming work. 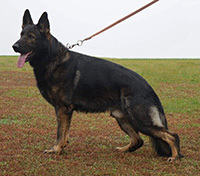 From his dam's side GAO also belongs to the 2nd blood line namely to the branch of famous DDR working dogs such as ALF Nordfelsen x GREIF v. Felsenstein, LOGAN Onyx, EX od Smithu, VILMAR z Marusky, CAR pod Molnosskou Banou, CONDOR An-Sat, ORI z Danaru, FURO Kamos, EX z Jirkova dvora a EMINA z Jirkova dvora. 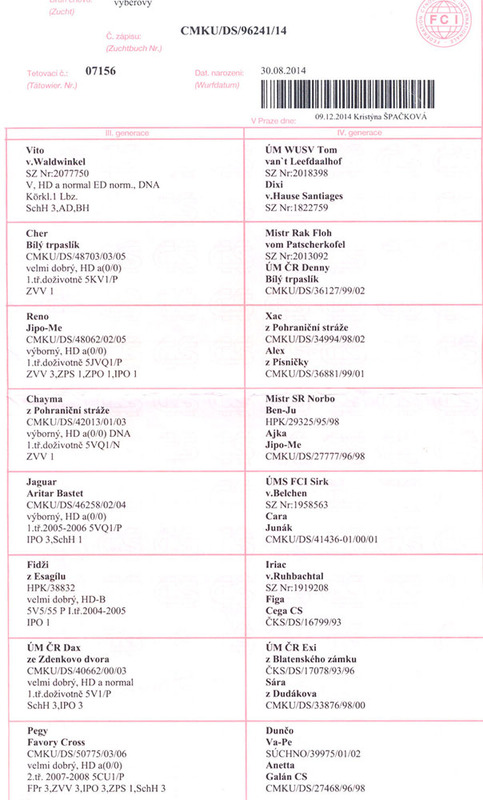 The whole range of these dogs competed several times at ZVV3 Czechoslovak National Championship, so called 500 pointer. These dogs were also ancestors of dogs that were used at Police or were themselves Police dogs. 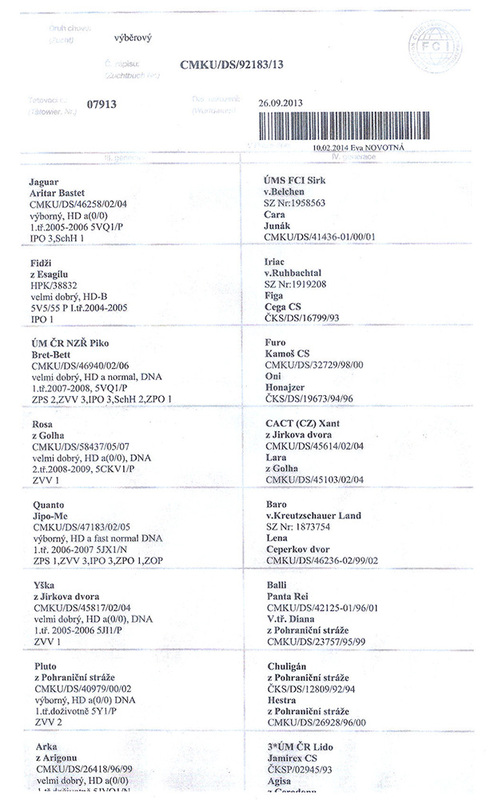 GAO is a product of 2nd bloodline and is in line strengthened 3-4-4 on FURO Kamos. This is evident in his comformation and temperament. GAO is absolutely hard dog but at the same time willing to work. He loves ball. He is able to do old tracks in different terrain types. His protection is absolutely real. He takes decoy as a prey in his whole complexity. At the same time he can be controlled. He loves doing protection inside the building where he takes this room as a territory that he is determined to protect against anybody. GAO is also a dog with quality comformation and his elegance and movement can easily compete with dogs coming from show lines. 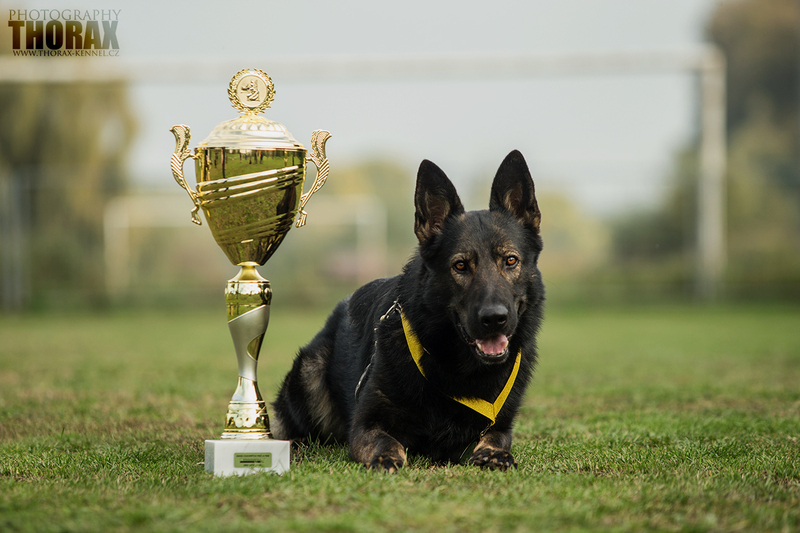 GAO is a dog that was never trained until March 2017 and from that time he completed ZVV1 title and will complete more titles in 2018. GAO is suitable to be used everywhere where there is need to improve strength and feeling for protection and overall self confidence of progeny. 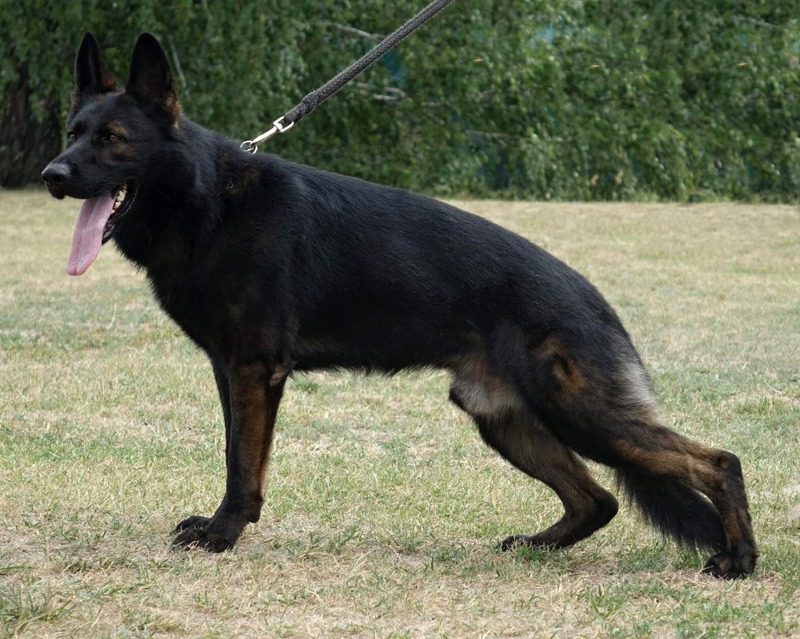 A'BRUNO belongs from the side of his sire KERY Kamos Durabo to the 2nd blood line. 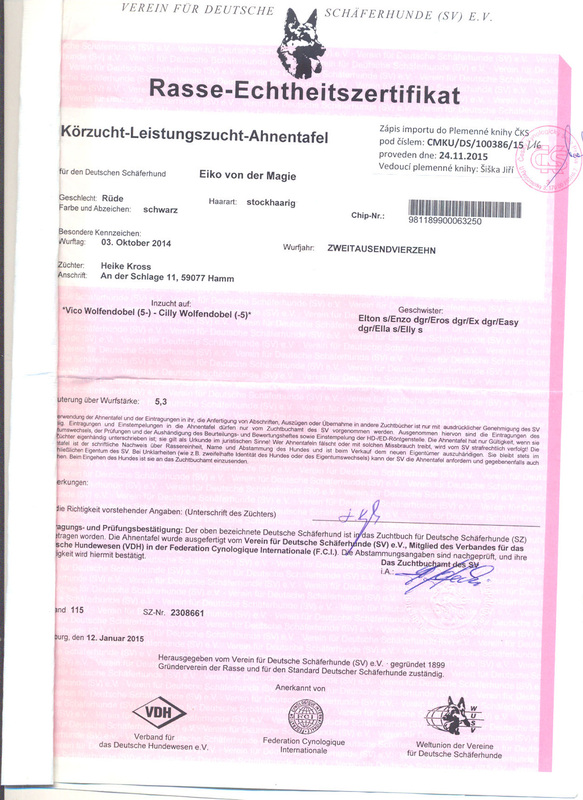 Therefore he comes from the world renowned working branch founded by FERO vom Zeuterner Himmelreich. 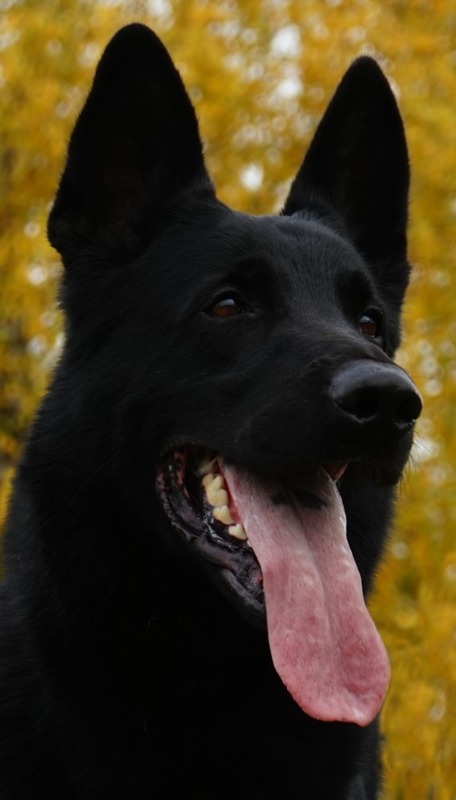 FERO is represented in the pedigrees of 90% of west German dogs that compete at international IPO3 competitions. 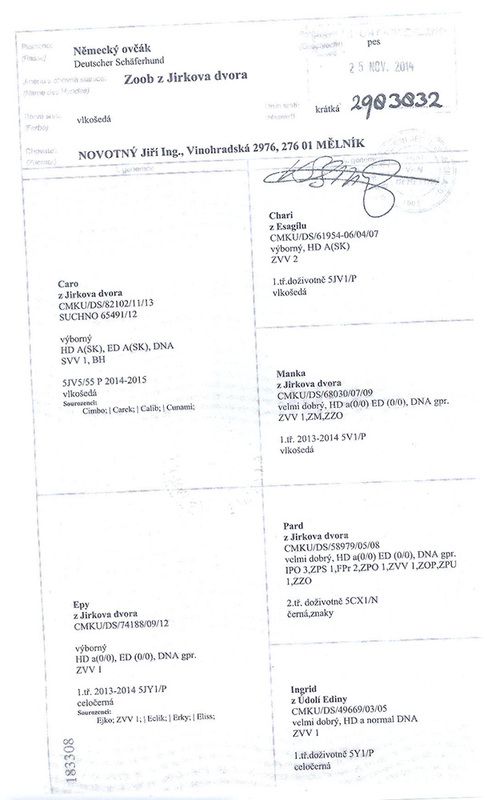 A'BRUNO's dam DRAGA z Vrchlickeho navrsi also belongs to the 2nd bloodline namely to the world renowned branch founded by MUTZ v.d. Pelztierfarm, JONNY v.d. 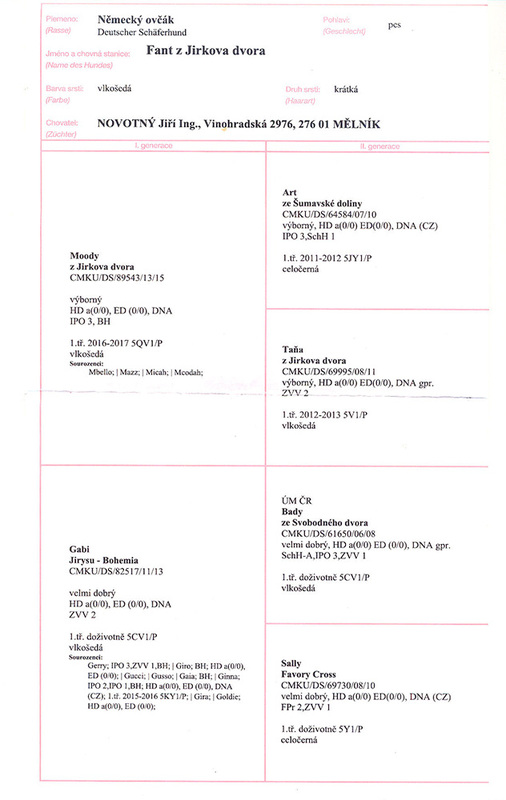 Rheinhalle, CANTO v. Amikos, FEDO Quercus, ZORO v.d. 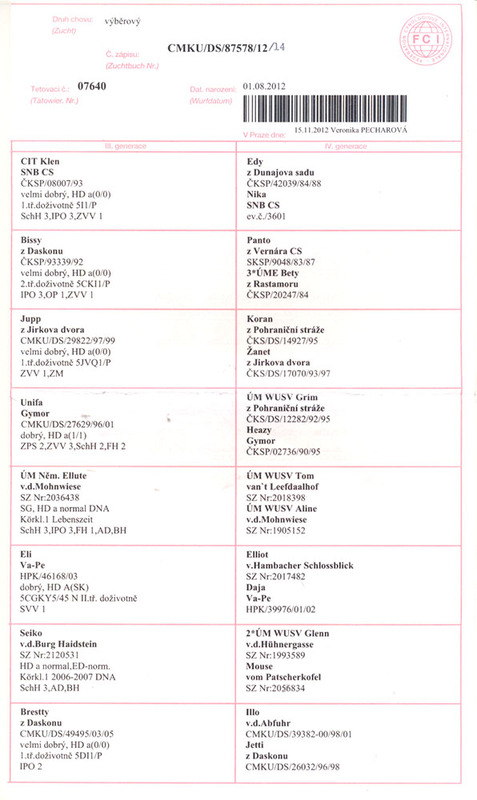 Wildsau, BARO v. Kreutzschauer Land, QUANTO Jipo Me and ZEN z Jirkova dvora. 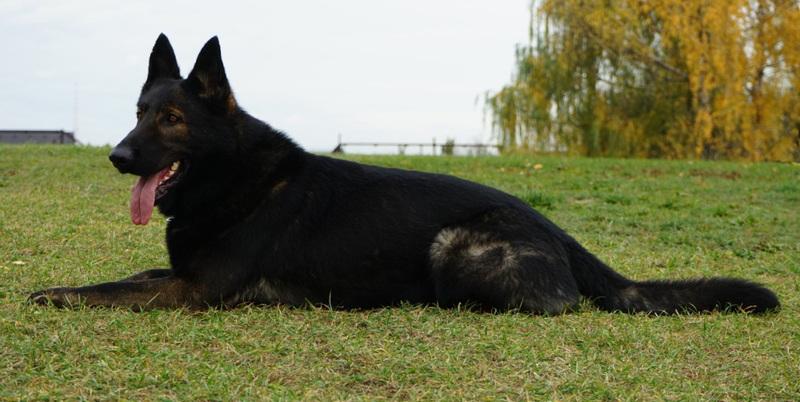 The side lines of his pedigree are also predominantly represented by dogs belonging to the 2nd bloodline. 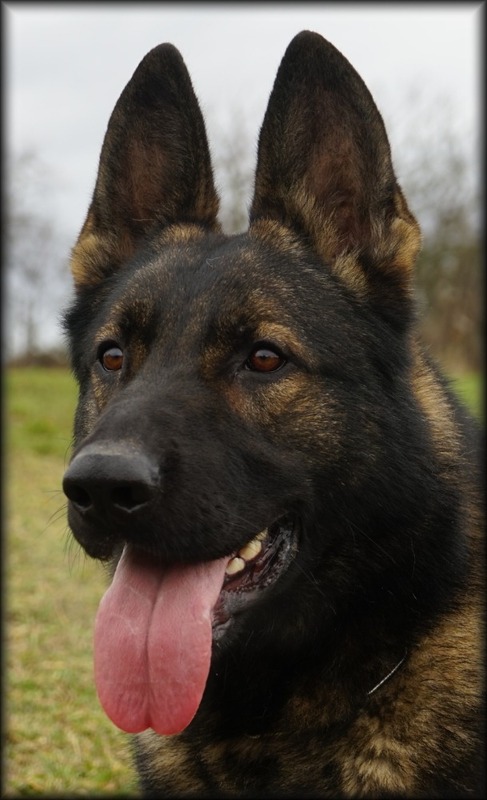 A'BRUNO is also in line strenghtened 3-3 on FURO Kamos. 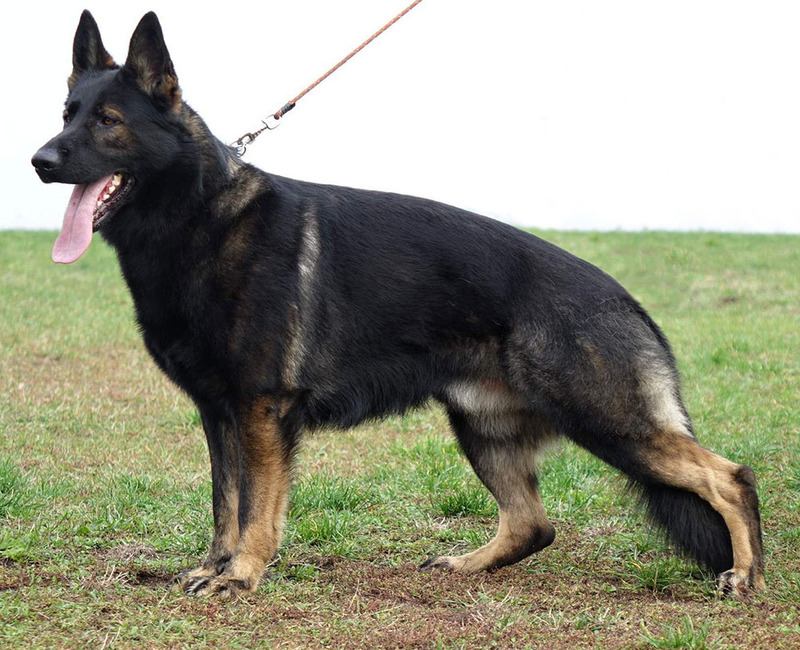 A'BRUNO's bloodlines make him a great prospect for at least national level competitions. 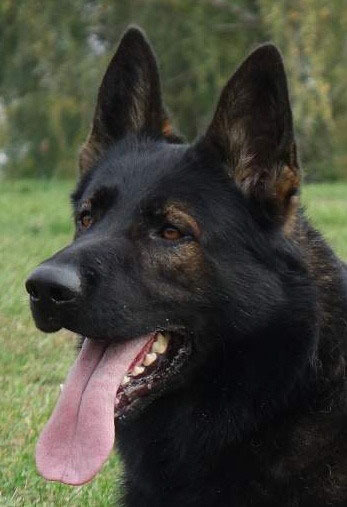 He will certainly be a significant producer of dogs not only for sport but also for hard police work with regards to his clear head and at the same time required hardness, passionate retrieve drive, strong defence drive and overall willingness to work. 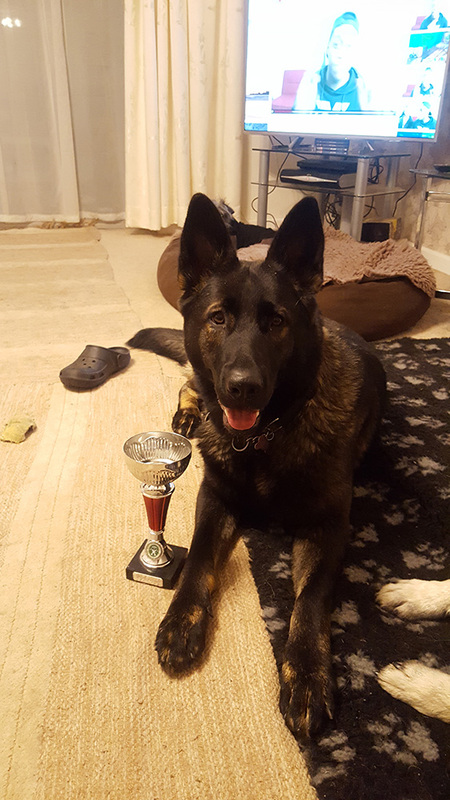 A'BRUNO has completed his IPO3 titled at the age of 2.5 years with 90/91/92 points. 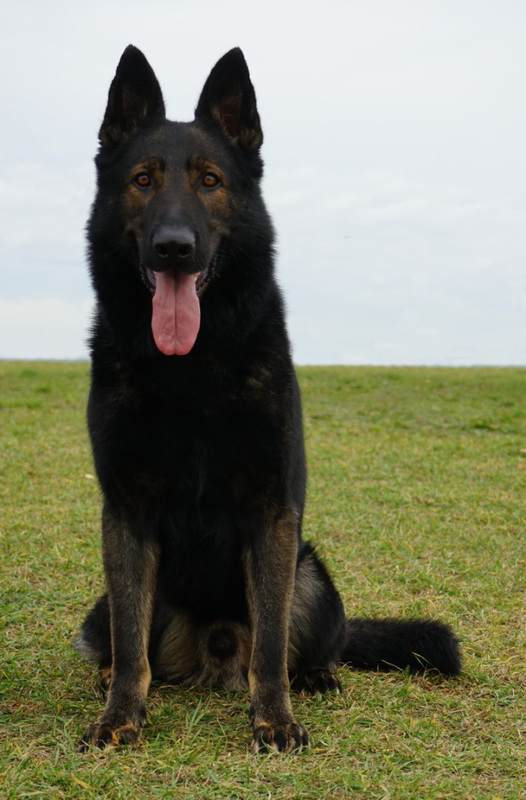 A'BRUNO is so far the most typical offspring of his father KERY Kamos Durabo whose blood is strengthened within the 2nd blooline. This fact offeres guarantee of is large hereditary strength. 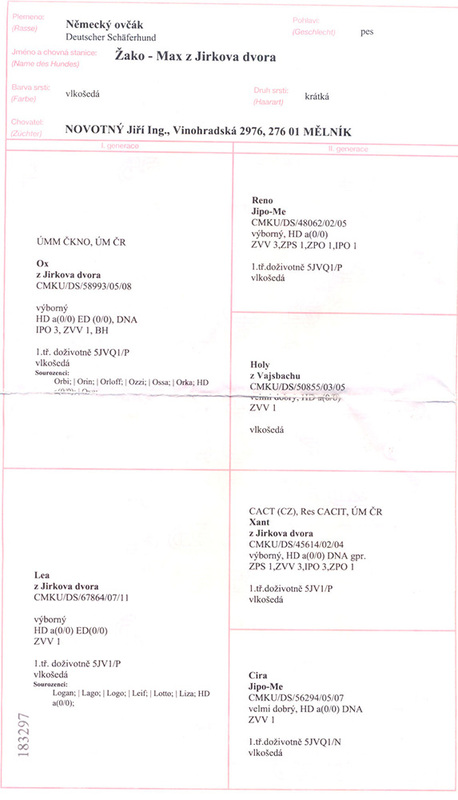 ZOOB z Jirkova dvora is owned by Mr. Lunding Remco in Netherlands. ZOOB belongs to the last few German Shepherds that are significant with traditional traits and features for which was German Shepherd bred by Mr. Stephanitz. At first sight it is evident that ZOOB has strong bones, firm body conformation, proportional balance, dark pigmentation, unmistakeable stud expression and strong temperament. 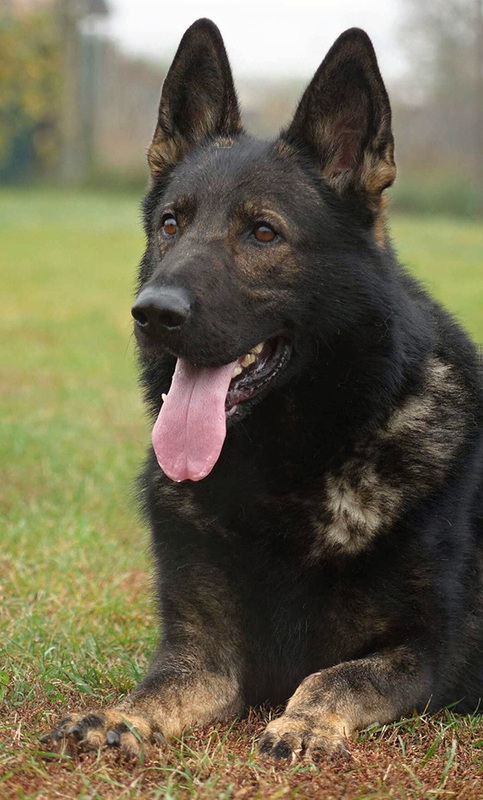 Among his most significant temperament traits belong incorruptibility, easy trainability, willingness to work for his handler, excelent tracking ability, real protection combined with territorial behavior. ZOOB is trained on regular basis. 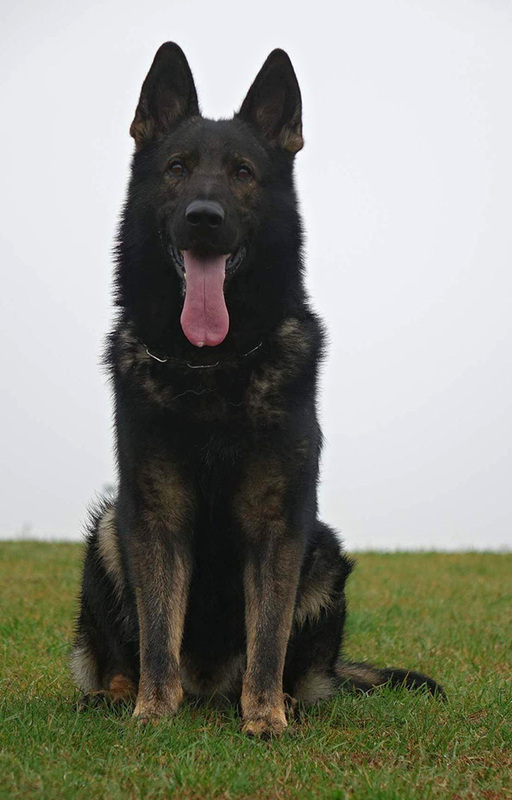 He is trained in sport and at the same time he trains in real situations along with Dutch Police dogs. 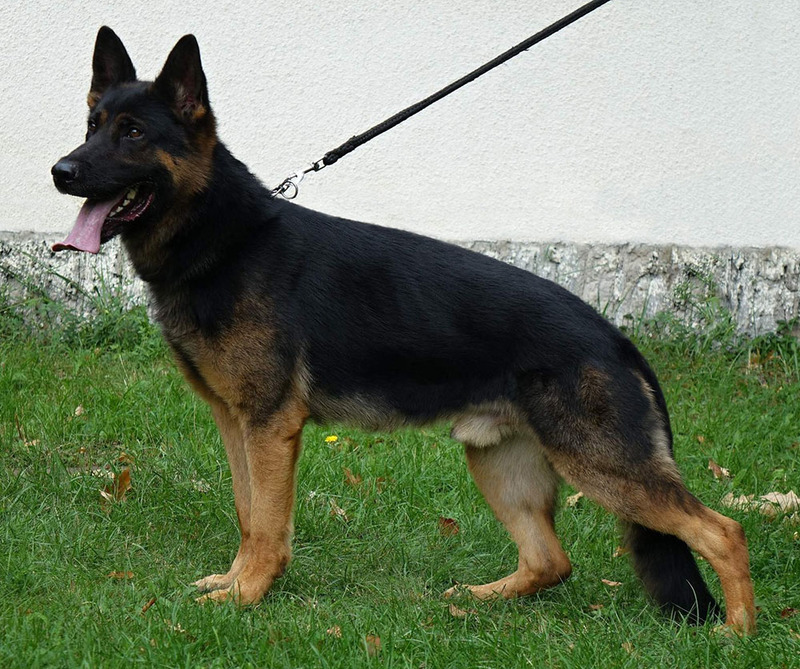 ZOOB belongs after his father CARO z Jirkova dvora and mother EPY z Jirkova dvora to the 2nd bloodline. 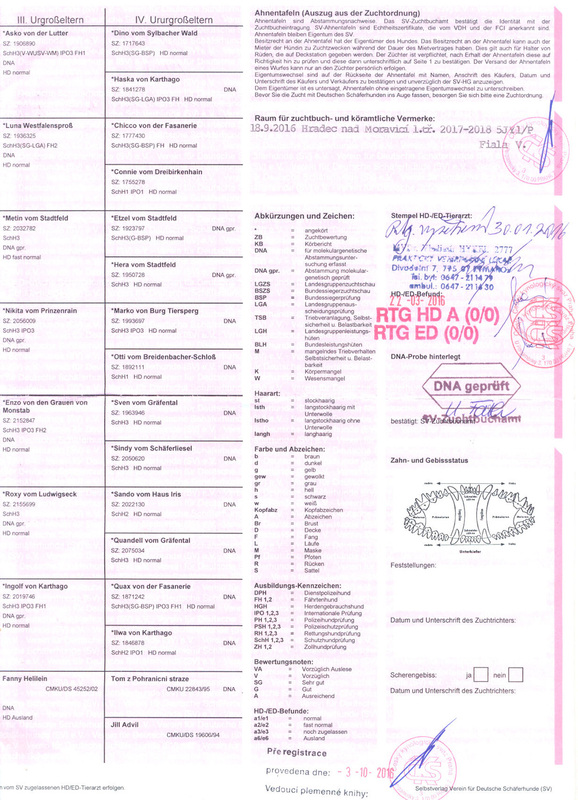 In his pedigree ALF v. Nordfelsen is present several times also from the side lines. 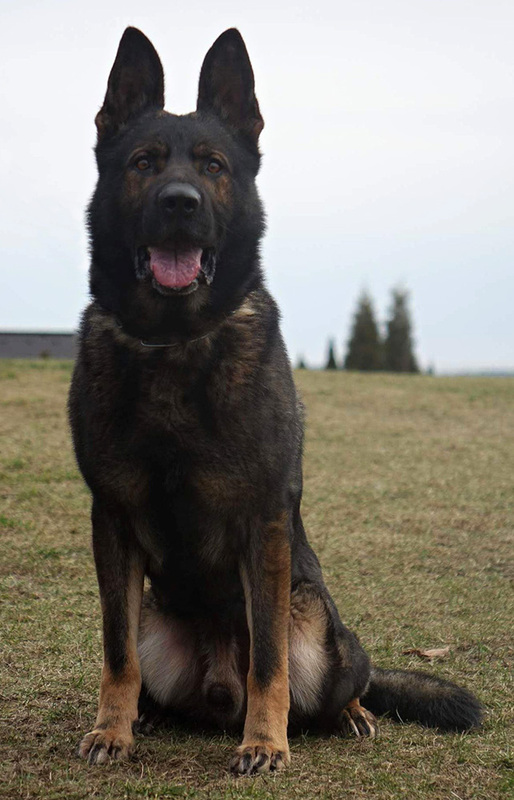 The blood of ALF ran in the blood of many service dogs that were used at service by Pohranicni straz and Czech Police. 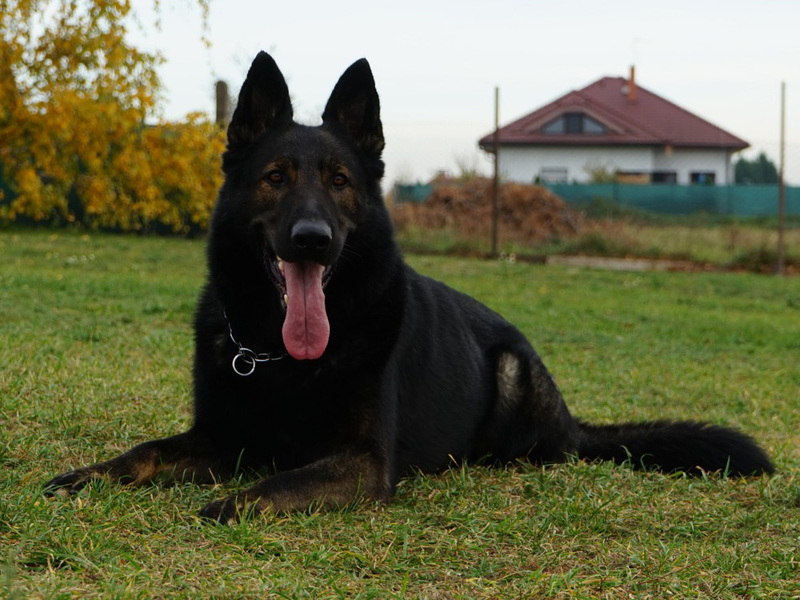 These dogs were proven by real life situations and as significant individuals they were used for breeding at z Pohranicni straze and Police kennels. 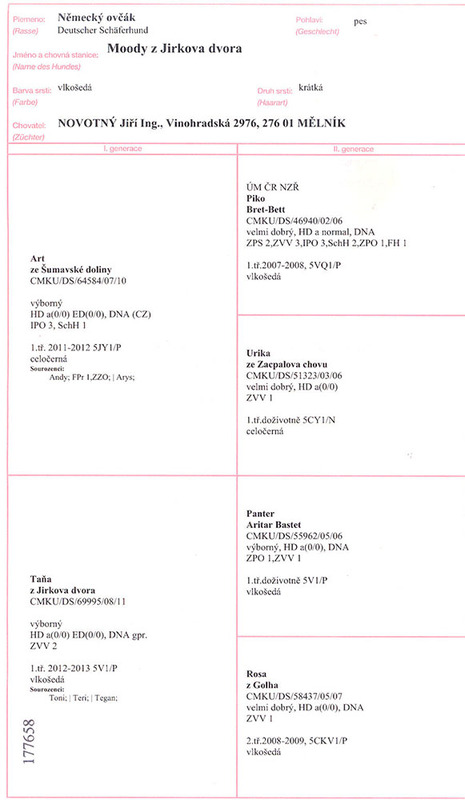 From the dam's side of ZOOB's pedigree there are dogs from 5th bloodline namely from the former DDR branch that was founded by legendary INGO v. Rudingen and so his blood is refreshed by such dogs as MANTO v. Kahlenbach, HELD v. Ritterberg, EMIL z Pohranièní straze. 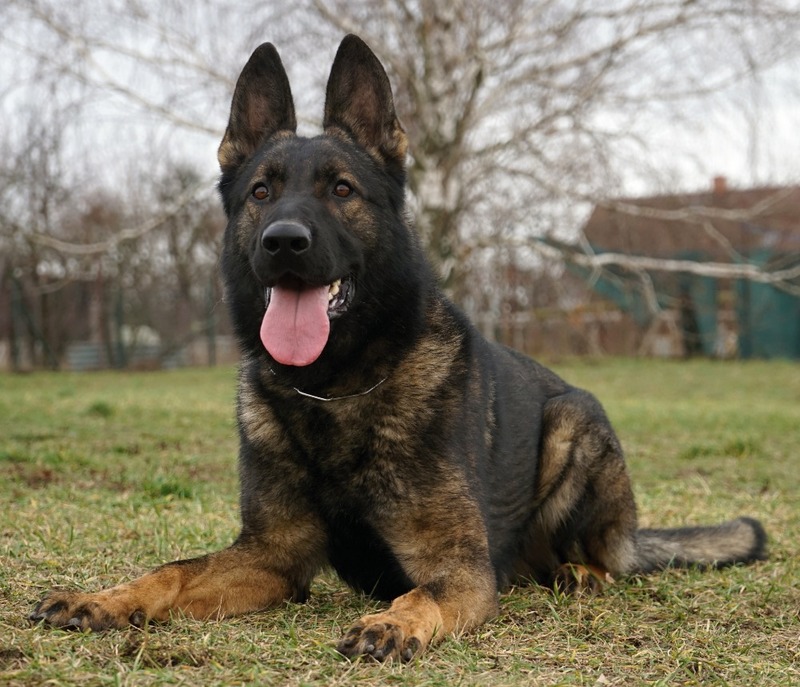 ZOOB can be called Czech dog because of his bloodlines. 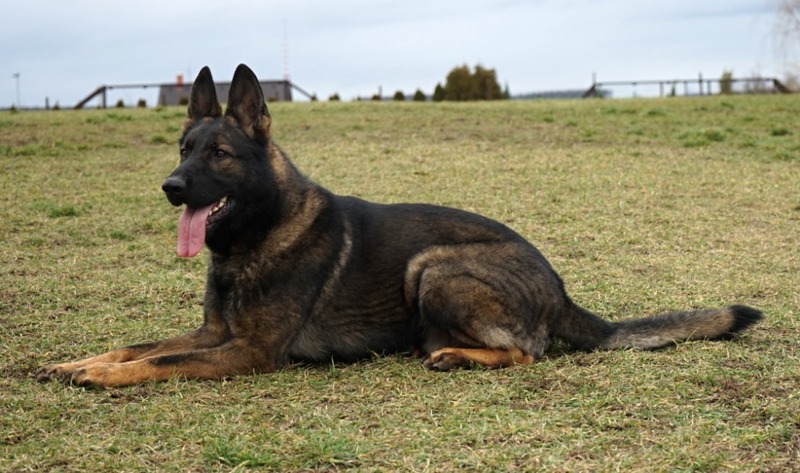 His first 3 generations in his pedigree originates in the breeding programs of Czech or Slovak Republic. 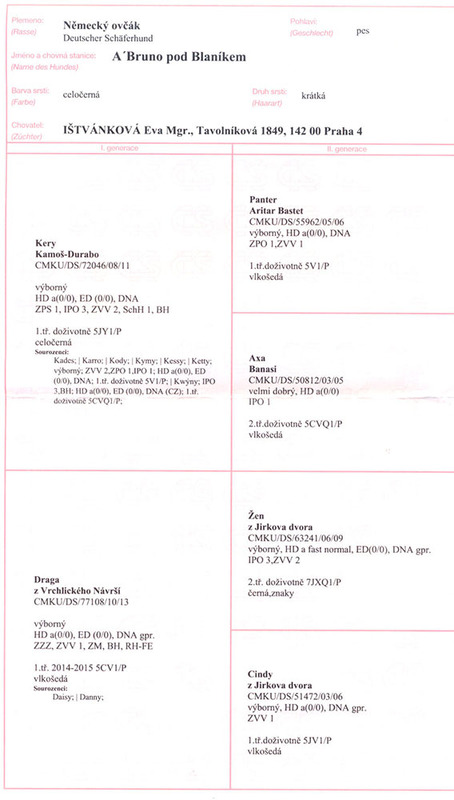 For the above reasons we plan to use ZOOB in our breeding program. 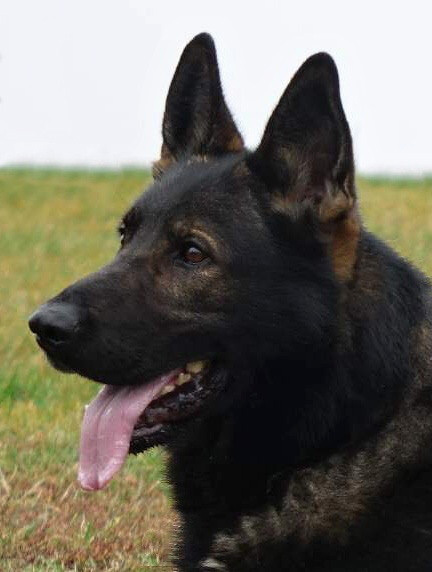 IDOLL IDOLL belongs from his sire's side (IBON Jipo-Me) to the 2nd bloodline namely to the world renowned working branch founded by FERO vom Zeuterner Himmelreich. 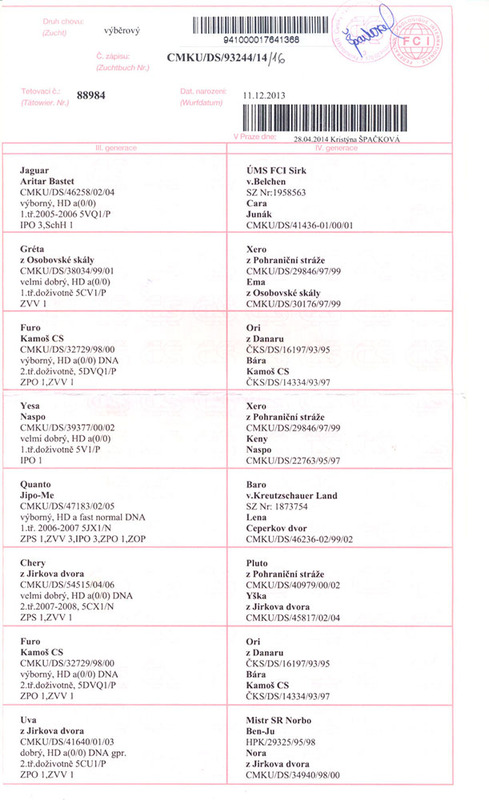 From his dam's side (ZUZA z Jirkova dvora) he belongs to the 4th bloodline namely to the branch best known in Czech Republic by representation of GERO z Blatenskeho zamku, XAC z PS, RENO Jipo-Me, OX z Jirkova dvora. 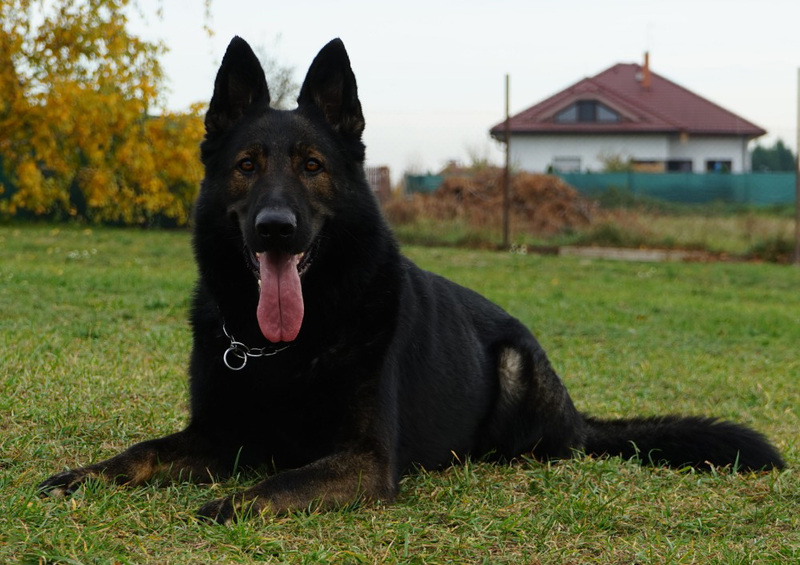 XANT z Jirkova dvora is represented in his pedigree twice and DARGO Ha-Ja-Da three times. IDOLL is a improved version of DARGO Ha-Ja-DA as far as body conformation and mainly color. 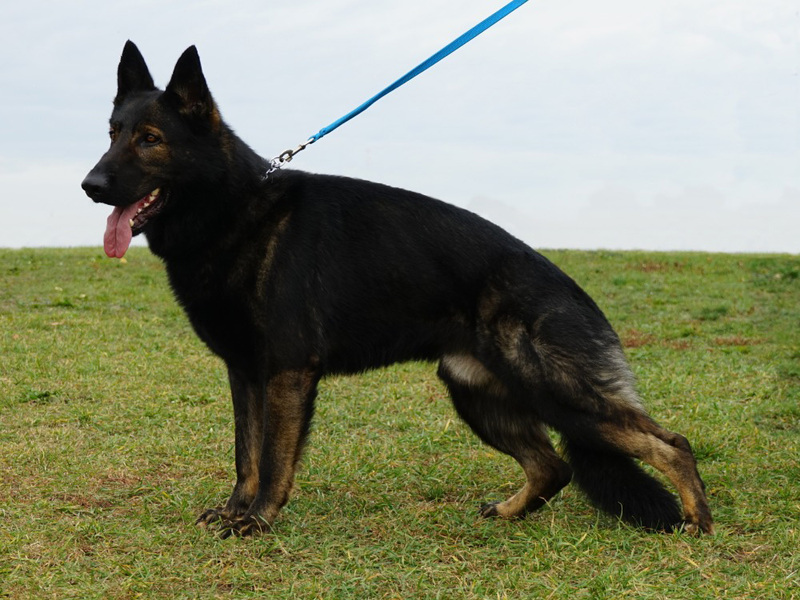 From DARGO he inherited medium size which is ideal for sport type of dog. He also inherited huge willingness to work. 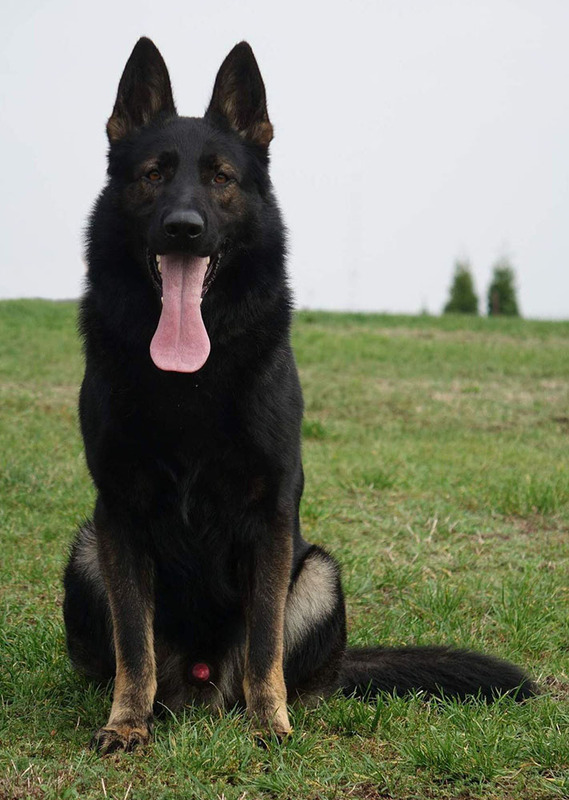 His drives are high, his temperament and willingness to work are very high. 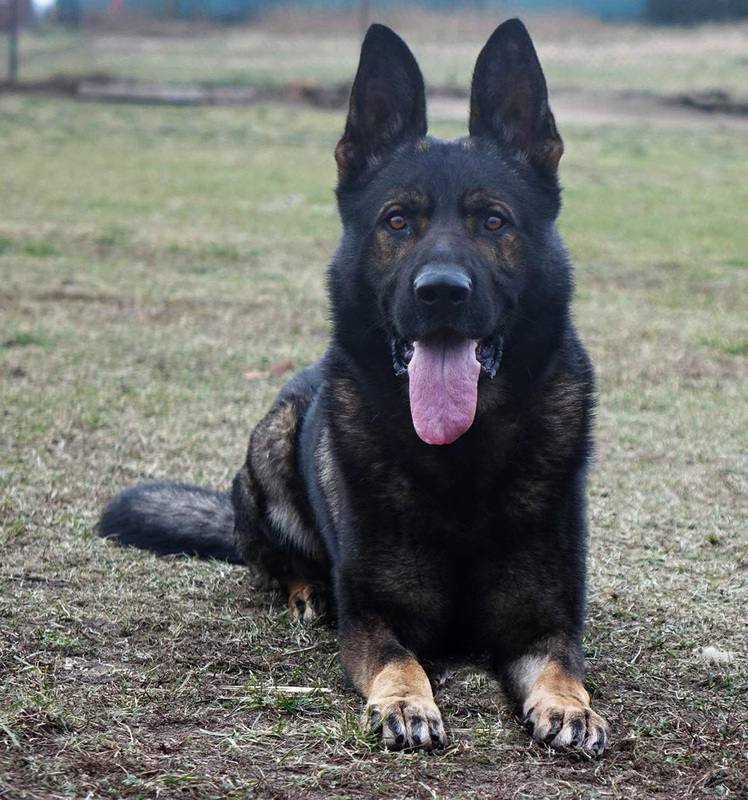 Exactly as was case with DARGO. From bloodlines point of view IDOLL is purely Czech dog. 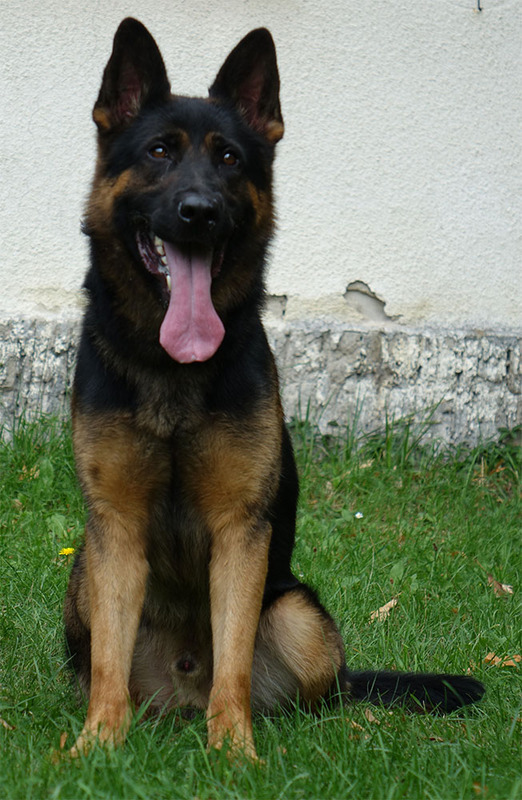 In his 3 generations of ancestors there are all dogs that were bred in the Czech Republic. We expectd IDOLL to produce not only his type and color but also his excellent temperament. We plan to compete with IDOLL in 2019. MOODY belongs to the 2nd bloodline both from his sire's and dam's sides. 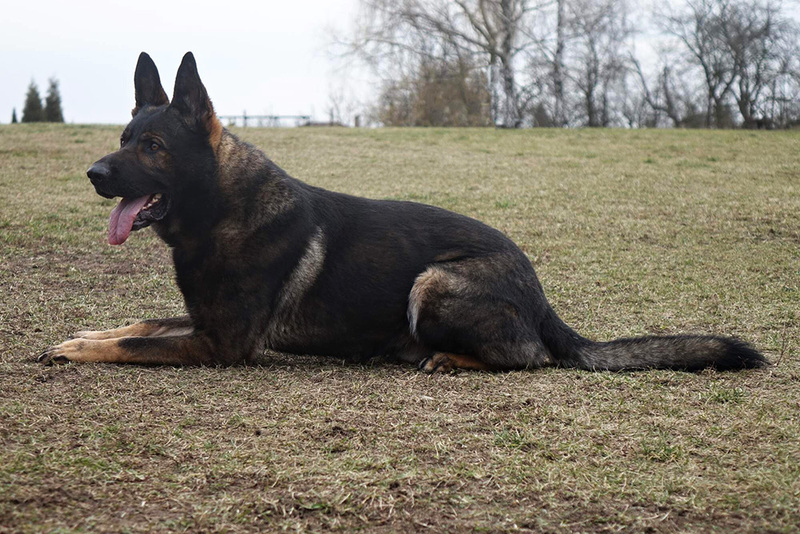 His father's branch comes from world renowned former DDR dogs from which the most used ones in the Czech breeding programs were LOGAN Onyx, EX od Schmidtu, VILMAR z Marusky, AJO Ja-Kra, CAR pod Molnosskou banou, CORDON An-Sat, ORI z Danaru, FURO Kamos, PIKO Bret Bett, ART ze Sumavske doliny. 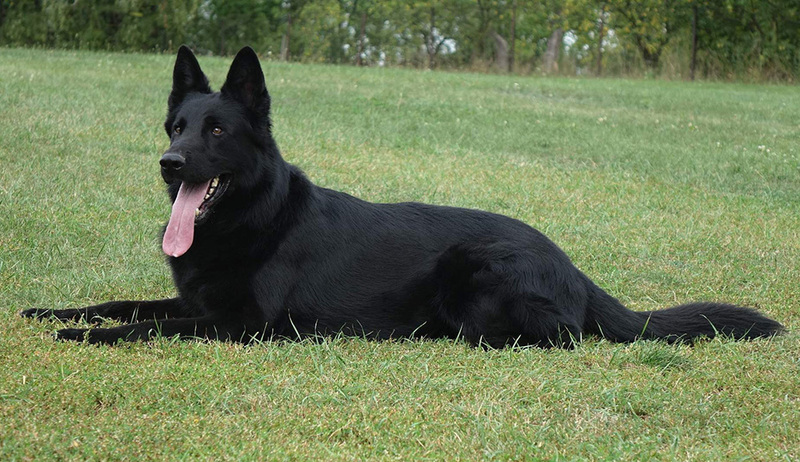 Most of these ancestors excelled with their working abilities, gorgeous black sable color that combined with very nice body conformation. 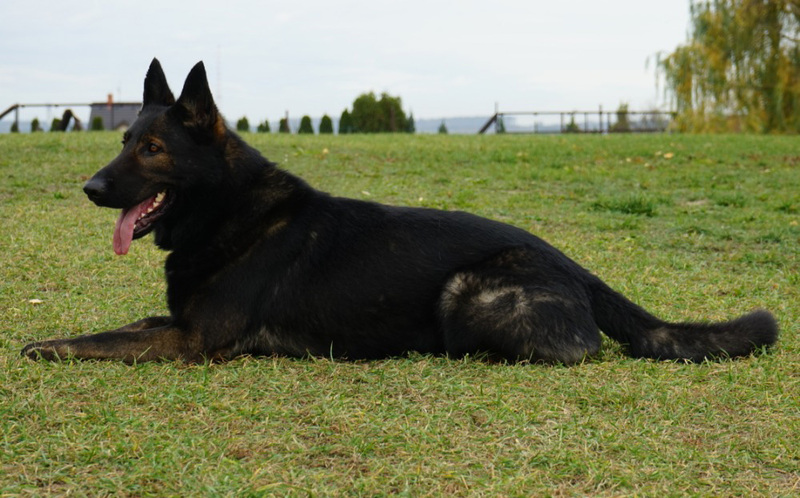 Yet CAR, CORDON, ORI and FURO were widely used at the Police and z Pohranicni straze kennels in the former Czechoslovakia. 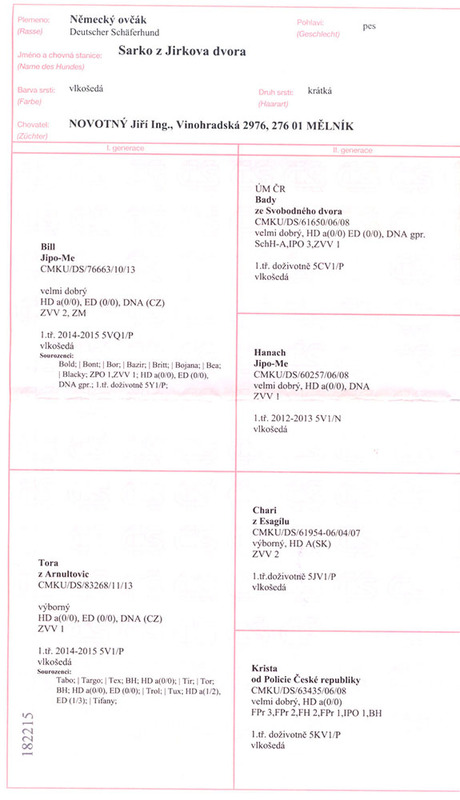 Ancestors of his mother also comes from 2nd bloodline but from West German working branch. 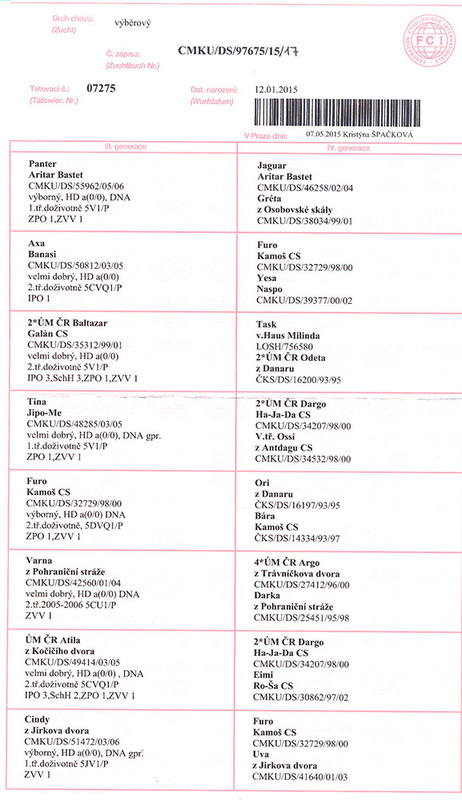 Among the most renowned ancestors from this side belong ALF v. Nordfelsen, X X X, FERO v. Zeuterner Himmelreich, TROLL v.d. 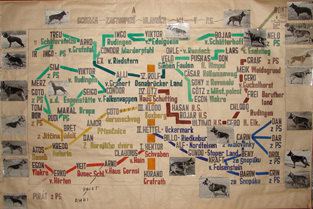 Bosen Nachbarschaft, ALY v. Vordersteinwald, SIRK v. Belchen, JAGUAR Aritar Bastet, PANTER Aritar Bastet. 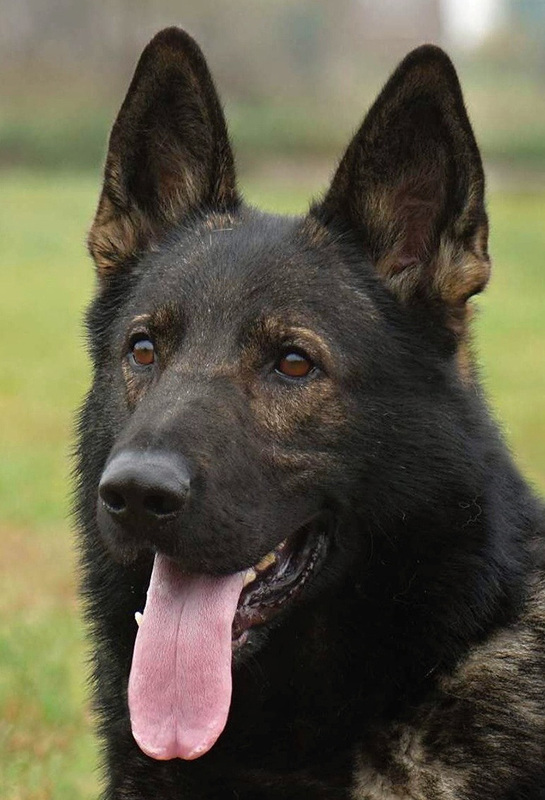 The blood of FERO circulates in 90% of working dogs in West Europe that are competing at World level. MOODY himself is very elegantly built, has gorgeous black sable color with correct bone strength and strong yet noble head. 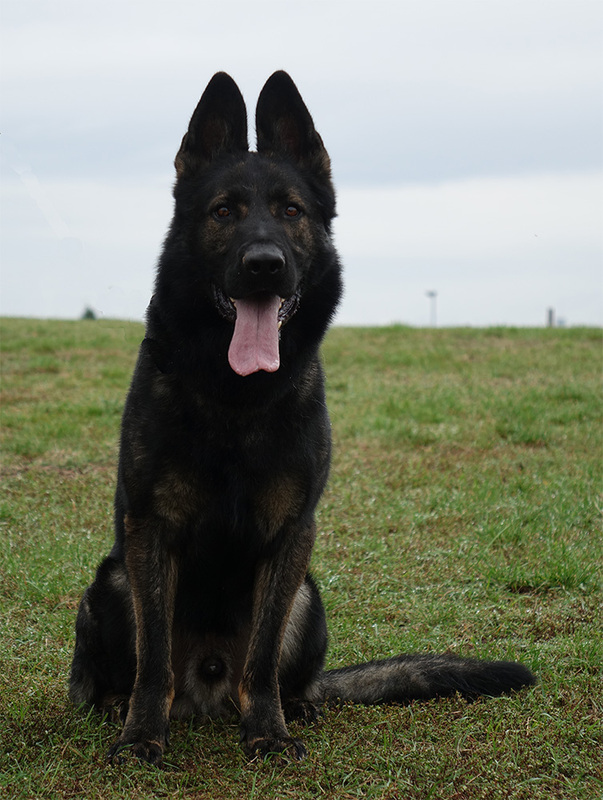 MOODY is a dog with high energy level, great working drives that loves to do all 3 phases. 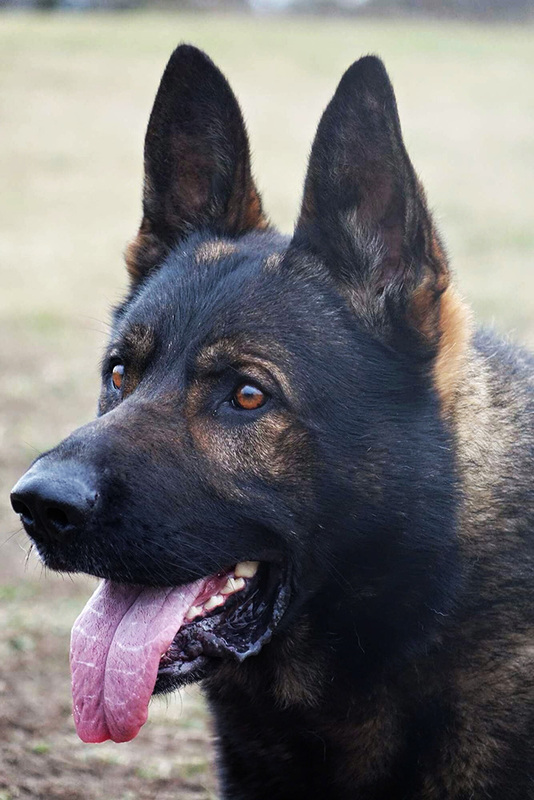 He loves tracking the same way as obedience and protection. 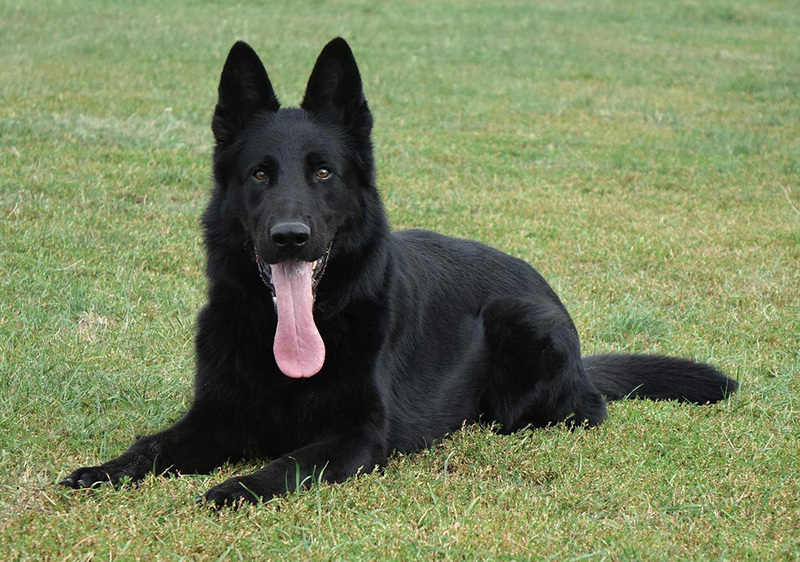 MOODY is a dog that can be easily controlled with normal social behavior and strong play drive. 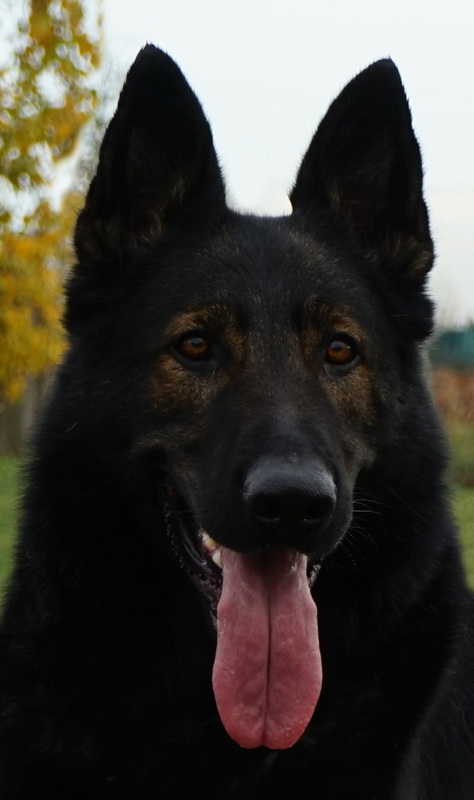 We expect MOODY to usefully compliment the rich collection of stud dogs coming from 2nd bloodline used by JINOPO. 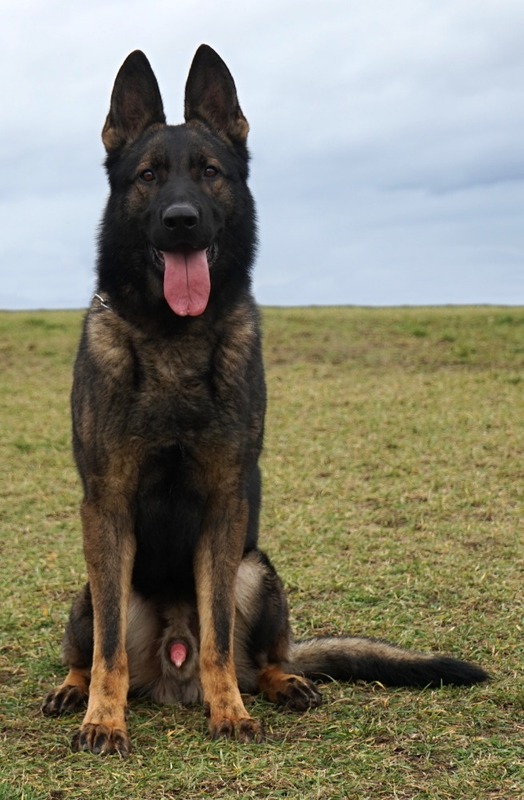 Further we expect MOODY to strengthen the working abilities and correct type of working GSDs representing the Czech breedings. He can be used everywhere where there is a lack of working willingness, dark pigmentation and strength of bones. 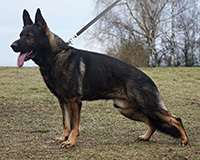 FANT belongs after his father MOODY z Jirkova dvora (BH, IPO3, National Championship competitor) to the 2nd bloodline namely to the former DDR working branch. This branch was founded by ALF Nordfelsen, GUNDO vom Stoperland, GREIF v. Felsenstrein, LOGAN Onyx, EX od Schmidtu, VILMAR z Marusky, AJO Ja-Kra, CAR pod Molnosskou banou, CORDON An-Sat, ORI z Danaru, FURO Kamos, PIKO Bret Bett, ART z Sumavske doliny. 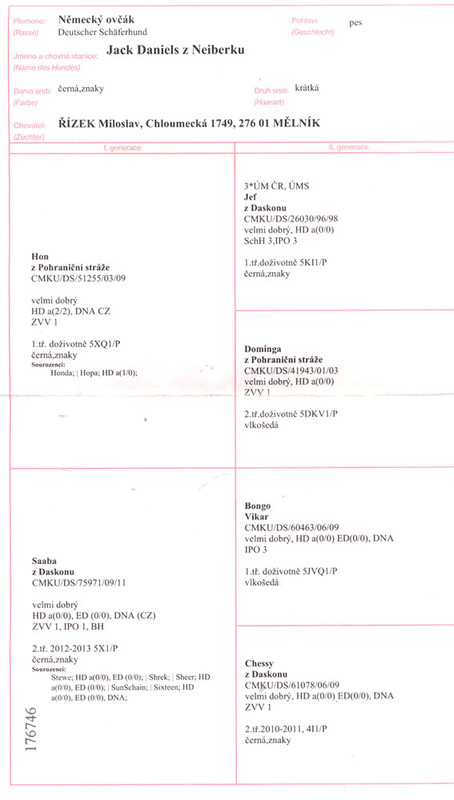 Dogs coming from this branch were plentifully used at breeding program of Police and Border Patrol (z Pohranicni straze) of former Czechoslovakia. 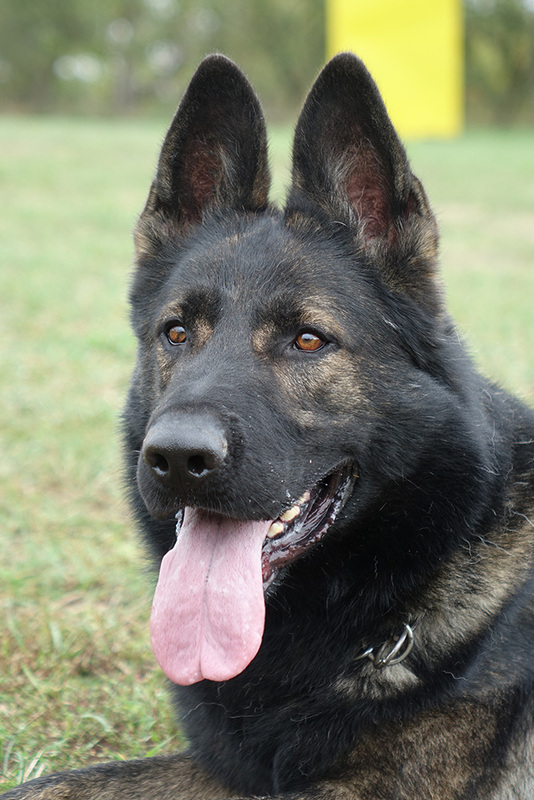 Many of offsprings of these dogs were used directly as service dogs. 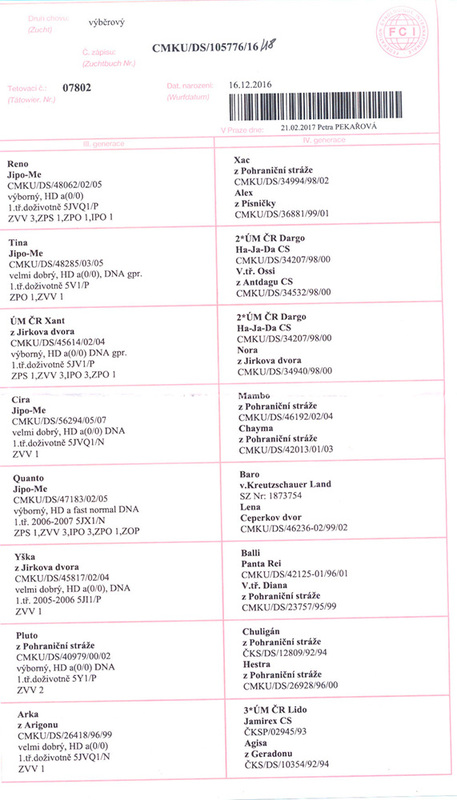 Among the most valuable conformation features were strength of the bones, dark pigmentation and overall elegant body conformation with strongly developed sexual expression. As far as temperament these dogs were faithful, vigilant with excellent sense of smell. Dogs were able to do 4 or more hours old tracks on different terrains. 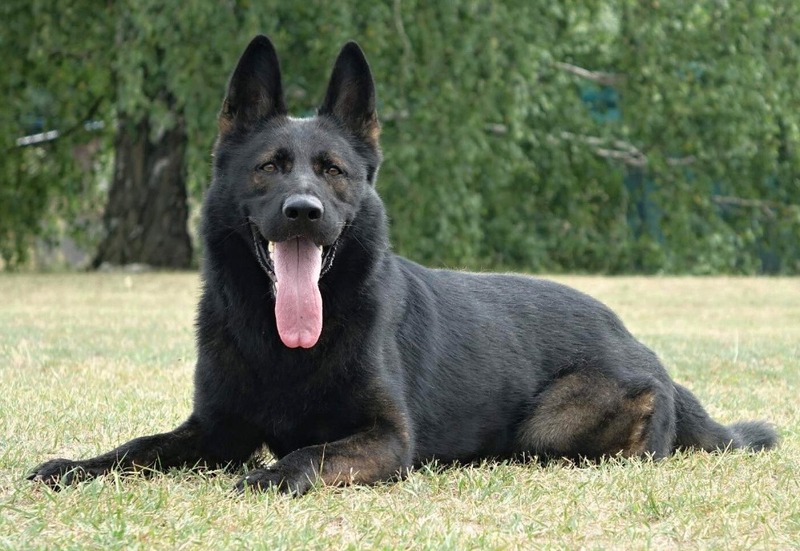 These dogs also excelled with natural very hard and real protection. They were biting very strong based on prey and defence drives. They were less willing in doing obedience. 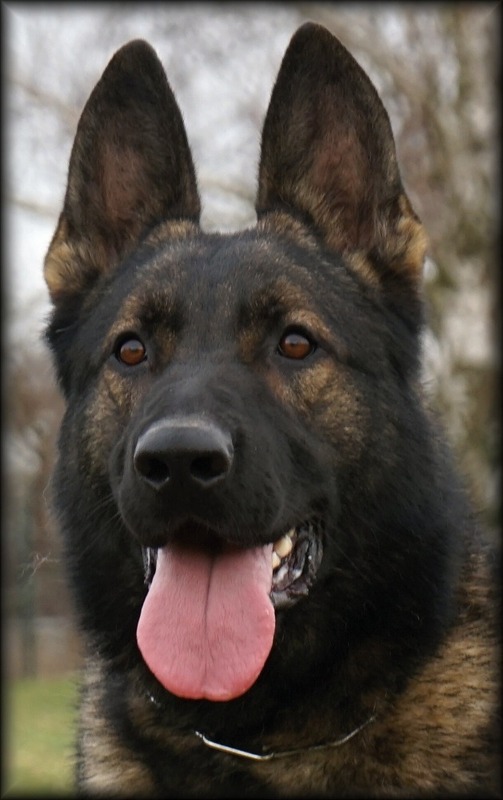 From his mother's side FANT belongs to the 5th blood line namely to the former DDR branch that was founded by famous dog INGO v. Rudingen. 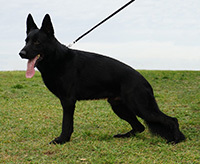 Other famous dogs in this lineage were WUSV competitor ORI v. Haus Antverpa, X, X, WUSV competitor TOM van t'Leefdaalhof, VITO v. Waldwinkel, National competitor BADY ze Svobodneho dvora and GABI Jirysu Bohemia. 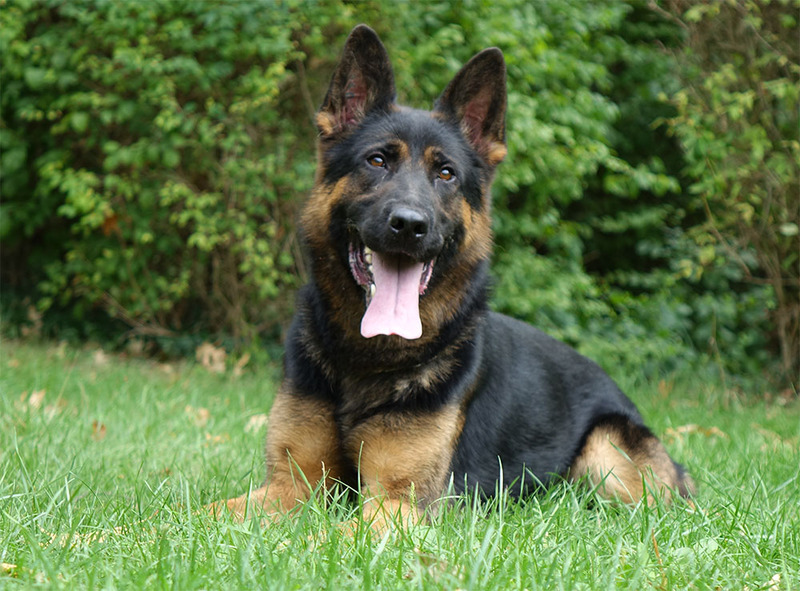 Dogs in this lineage excel in willingness , very nice obedience, very good strong and fast protection that are based mainly on prey drive. FANT himself is an ideal specimen of working dog not only with is size and weight (64 cm and 38 kg) but also with his huge muscled strong body, his absolutely willing working temperament, easy controllability that is combined with excellent sense of smell, strong prey, hunt and defence drives. FANT is suitable to be used everywhere where there is a need to improve pigmentation, bone strength and willingness to work of the progeny. 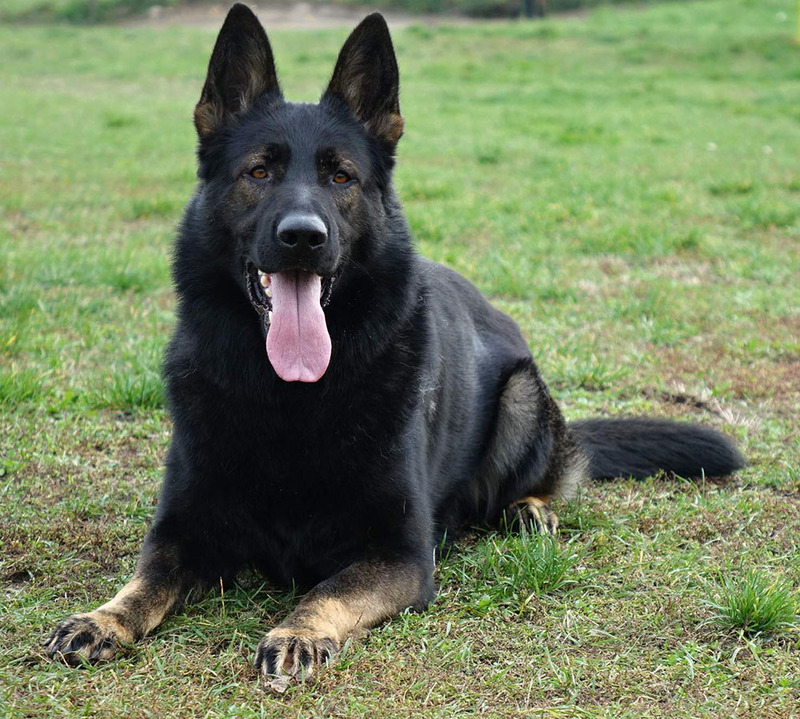 From FANT we expect that he will further strengthens and unifies working type and temperaments of the dogs bred at JINOPO. 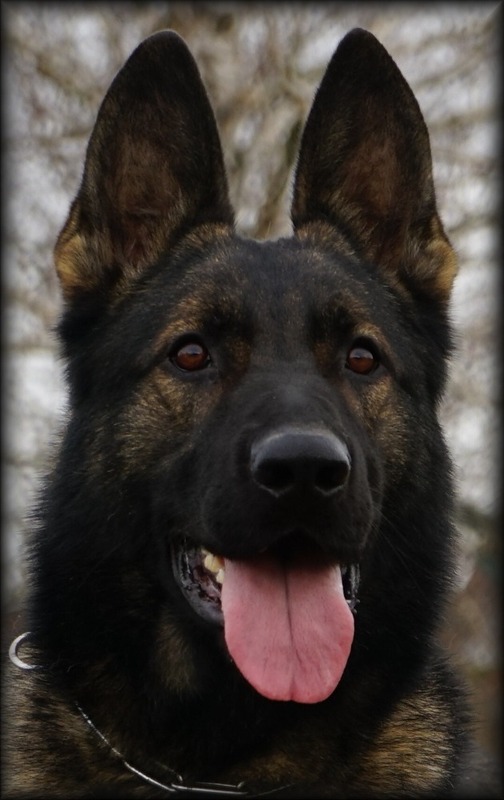 We further believe that he will be a great contributor for health of his progeny. He should also improve the ability of puppies to work in early age. 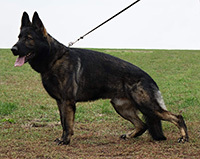 CADET belongs from his sire's (ARAM Tufra) side to the 4th blood line, namely to the branch long used by JINOPO, that was founded by legendary GERO z Blatenskeho zamku. 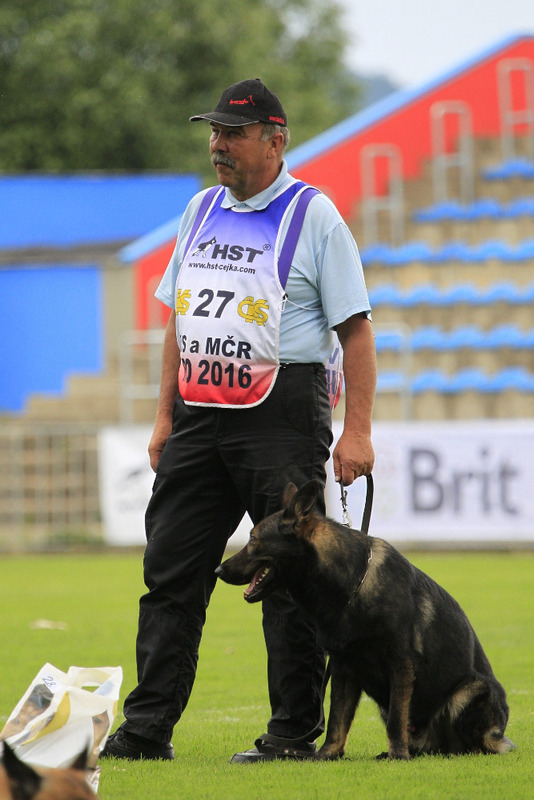 Bloodline was followed by XAC z Pohranicni straze, RENO Jipo Me, JAGO Jipo Me (competing at WUSV World championship in Ukraine). From these dogs CADET inherited required strength of bones, pigmentation and perfect traits for tracking, required fighting drive and harness in protection. 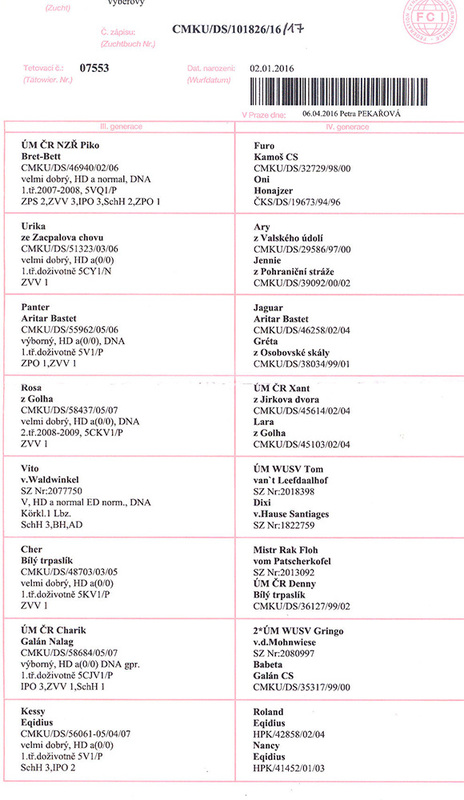 From his dam's (EPY z Jirkova dvora) side he belongs to the 2nd bloodline also to the branch that has been used long by JINOPO. This branch was founded by BARO v. Kreutzschauer Land. 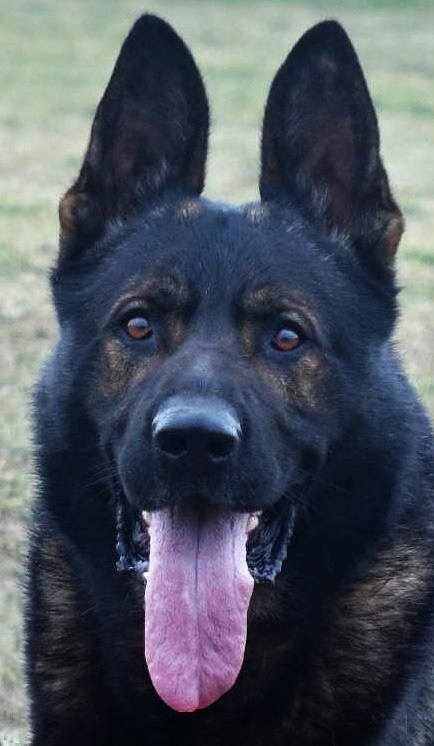 BARO was a stud dog used at breeding program of Swedisch Police. 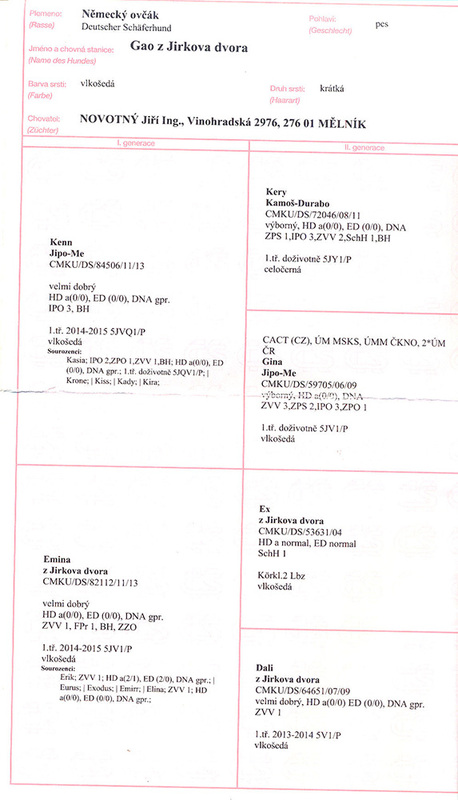 He is followed in pedigree by QUANTO JIpo Me and PARD z Jirkova dvora. 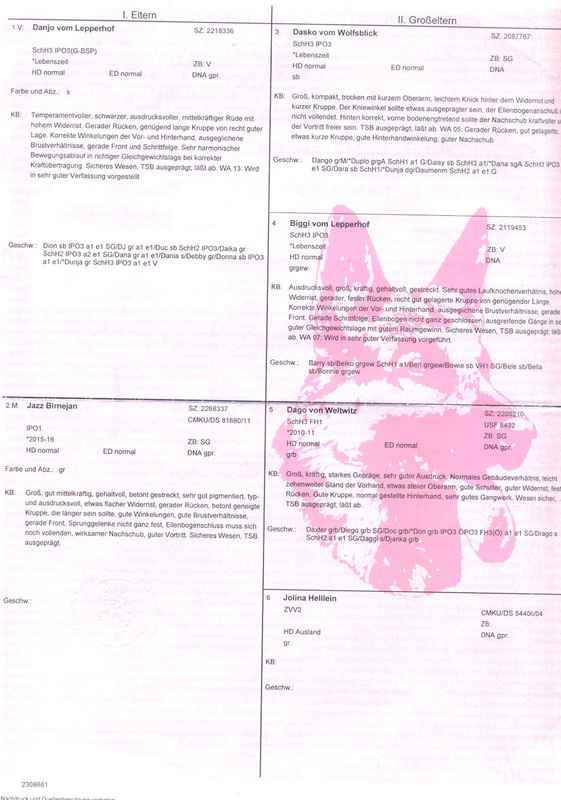 Other significant dogs in his mother's pedigree are PLUTO, CHULIGAN and EMIL z Pohranicni straze. 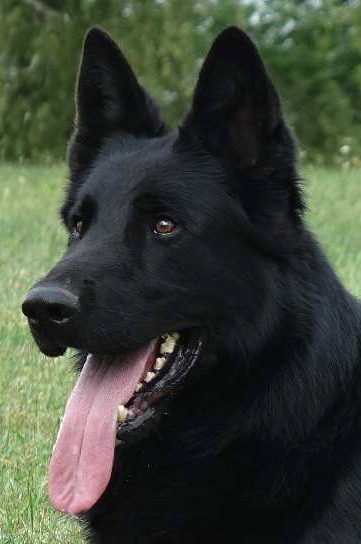 These dogs were significant for their DDR type, strength of bones and huge heads. 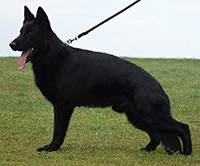 Another excellent dog in his pedigree is BALLI Panta Rei representing also excellent DDR branch via INGO v. Rudingen and MANTO v. Kahlenbach. All these ancestors only strenghtened the size of the bones, distinctiveness of heads with significant stop. CADET himself is strong but elegant with noticeable stud head. 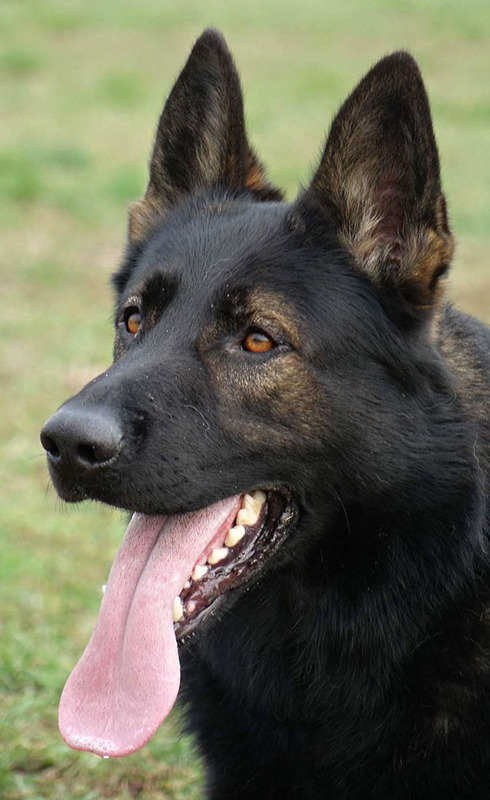 He is a very well pigmented dog with willingness to work. 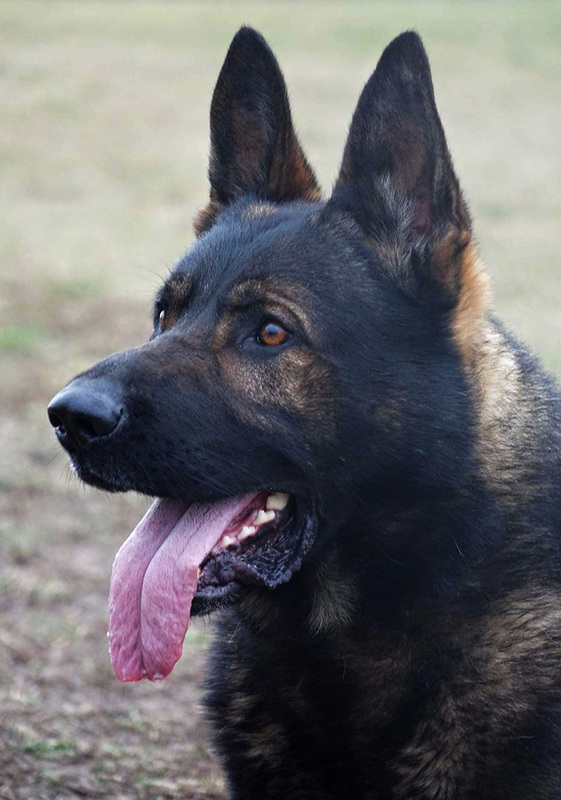 He has very good traits for tracking and protection. He is self confident. In obedience he's hard headed but willing. 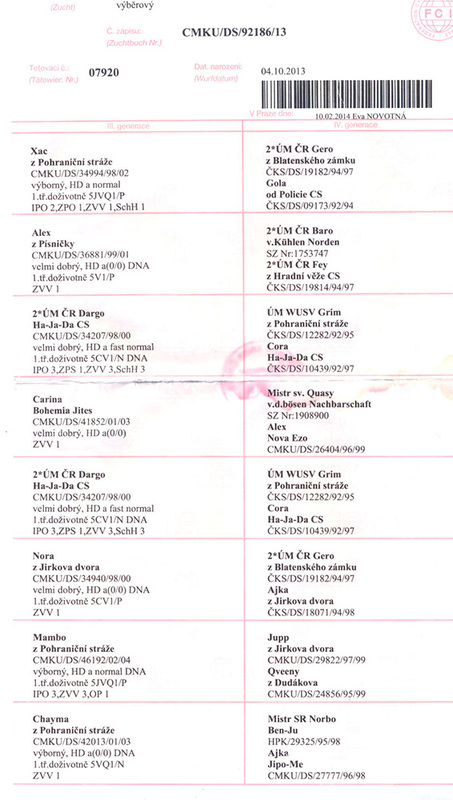 CADET can be used for females that need to improve the above described conformation features and character traits. At moment he is still being trained so in 2020 he can be shown at national competition level. 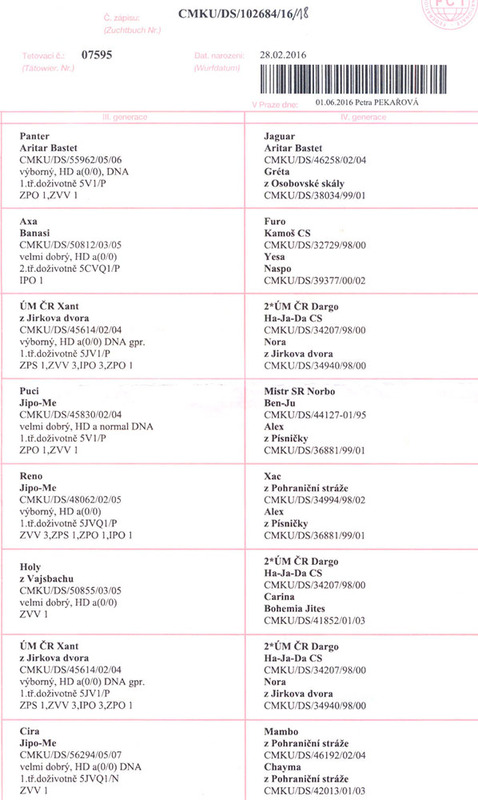 ZAKO MAX z Jirkova dvora belongs from his sire's side (OX z Jirkova dvora) to the 4th bloodline. 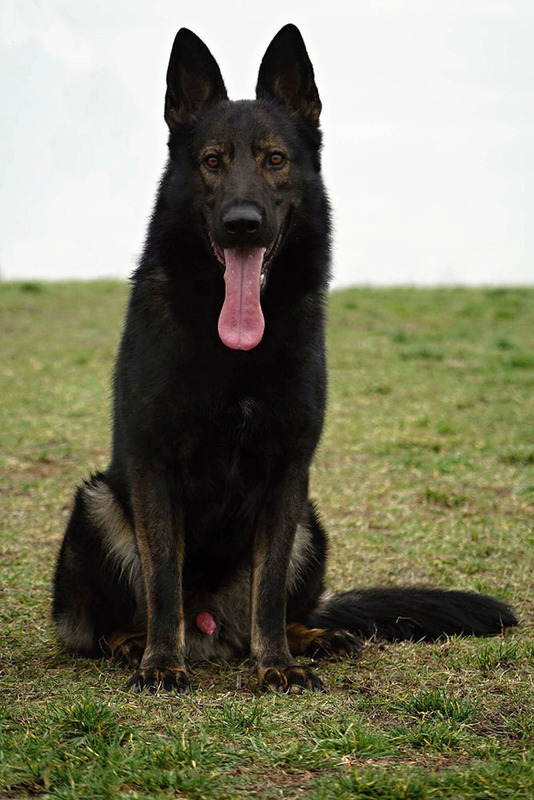 He represents already 8th generation of dogs bred in the Czech Republic. 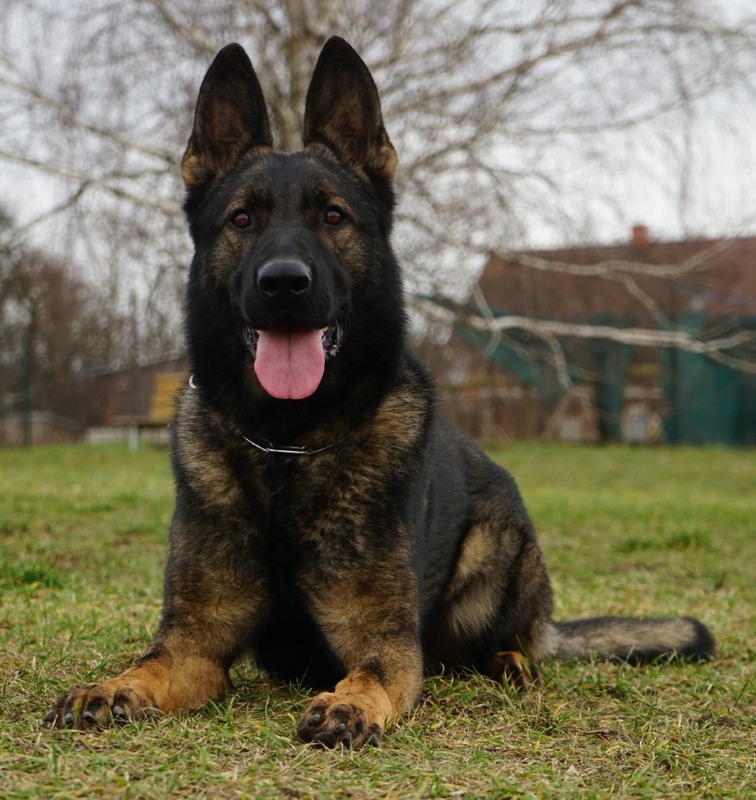 His mother LEA z Jirkova dvora is a representative of 3rd blood line and belongs to the 7th generation of dogs bred in the Czech Republic. 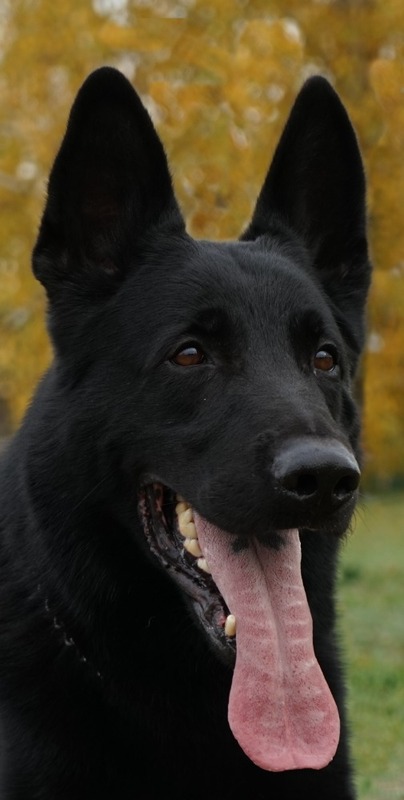 ZAKO MAX can be therefore considered a dog coming purely from Czech bloodlines. His type is closer to his father's bloodline. 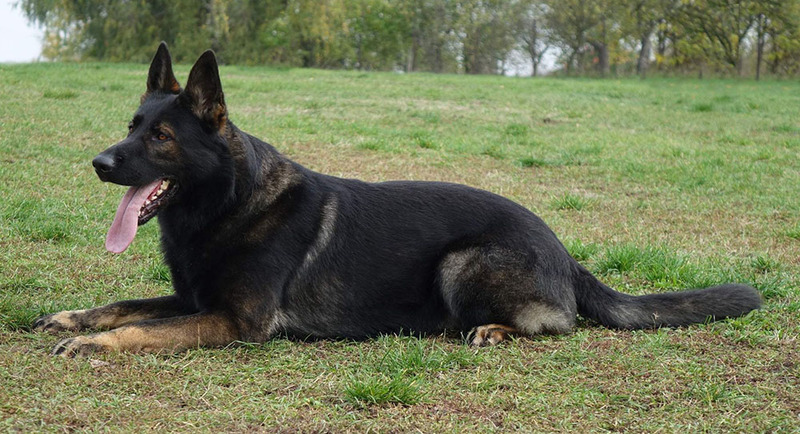 His fighting drive and hardness is solidified from both sire's and dam's side. 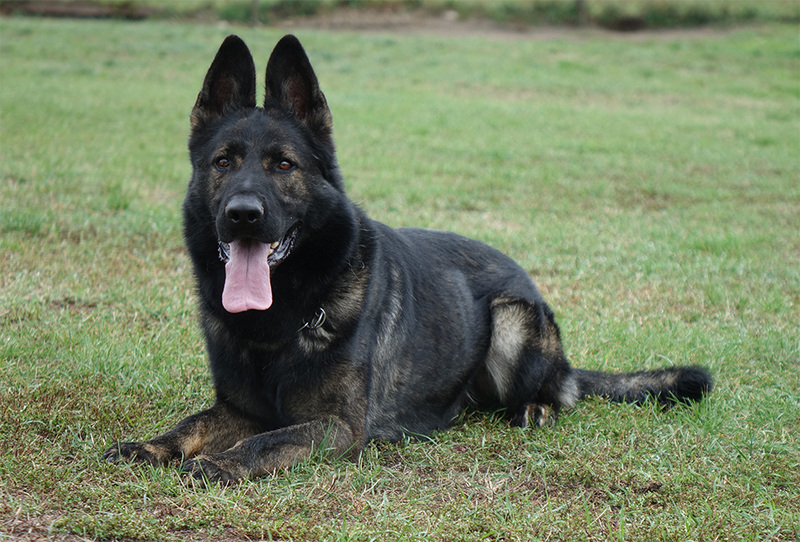 His reliability in tracking comes from in line breeding 3-3 on DARGO Ha-Ja-Da. 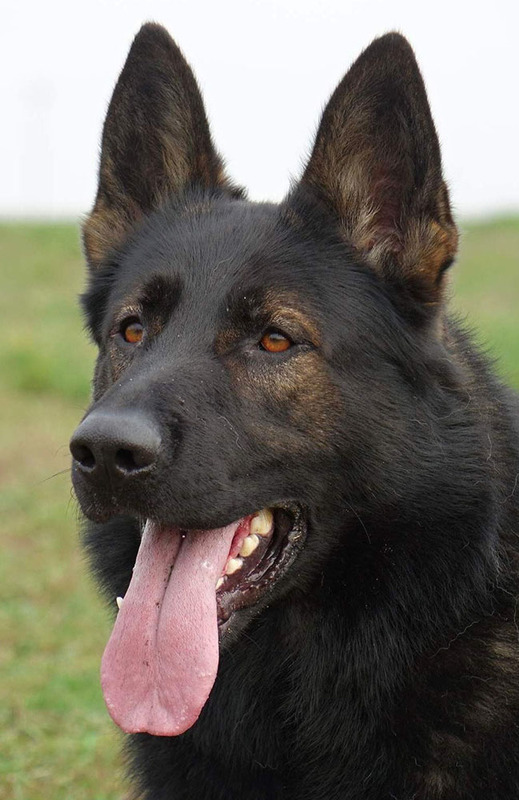 ZAKO MAX's temperament is resembles strong service dogs used by Police and Military. 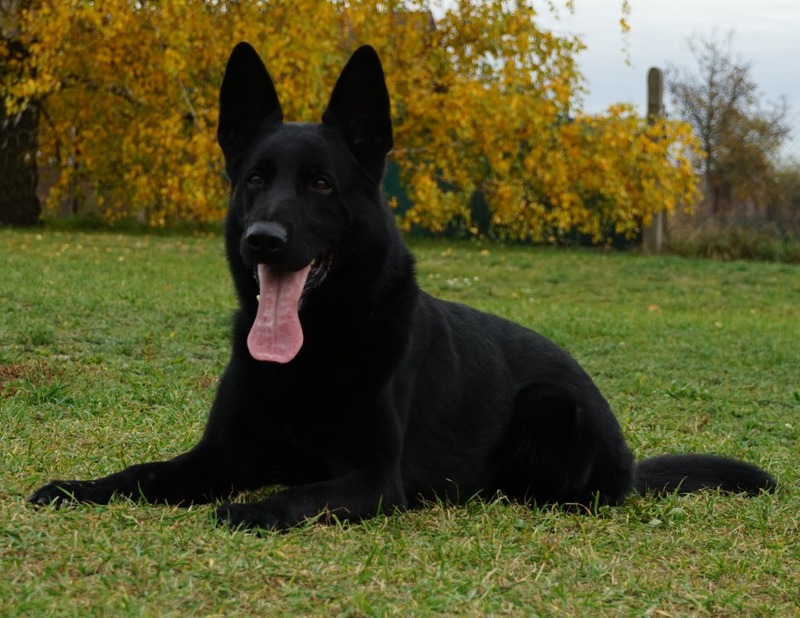 ZAKO MAX has completed his ZVV3 title already at the age of 2.5 years. ZAKO MAX is suitable to be used on females that need to improve fighting drive, self confidence, pigmentation and bone strength. 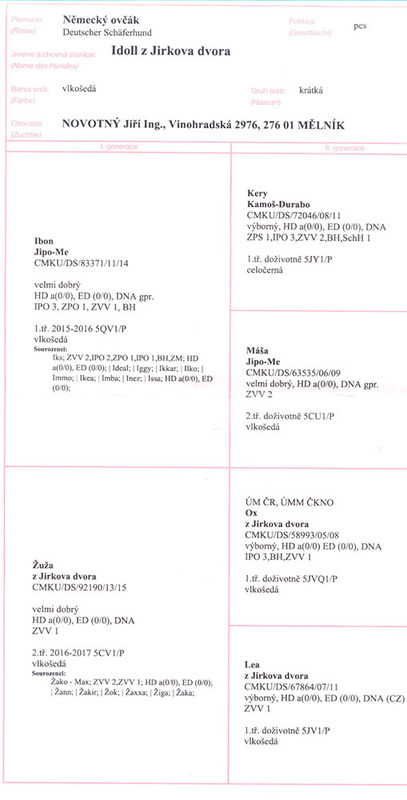 ZAKO MAX's sister ZUZA is also used at JINOPO's breeding program. 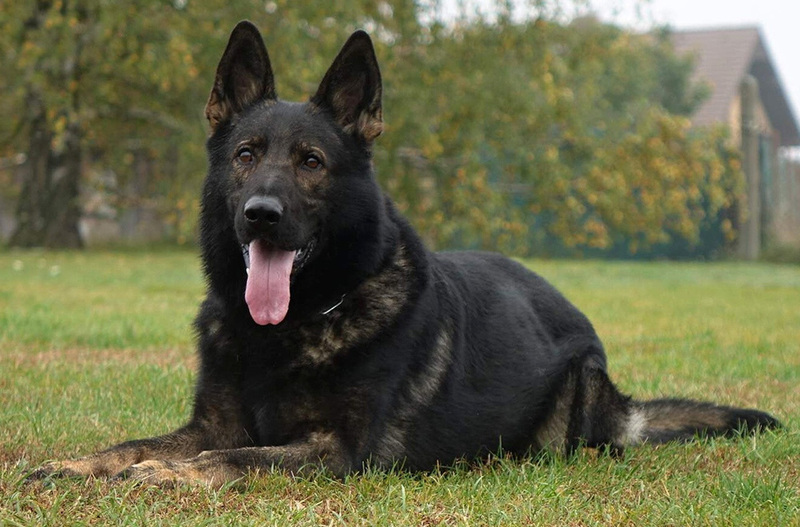 SARKO belongs from his sire's side to the 5th bloodline, namely to the famous working branch that was founded by INGO v. Rudingen via ORY v. Haus Antverpa, TOM van t'Leefdaalhof, VITO Waldvinkel, BADY ze Svobodneho dvora. 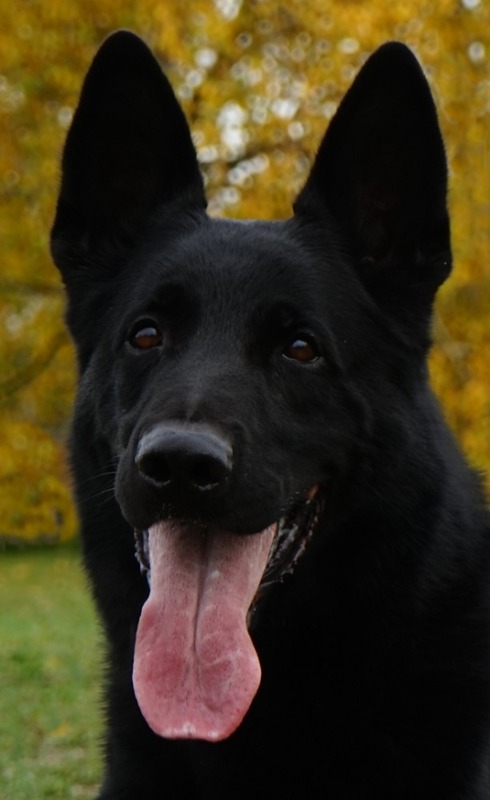 From his dam's side he belongs to the 2nd bloodline namely to the world renowned West German working branch founded by FERO v.d. Zeuterner Himmelreich, via SIRK v. Belchen, JAGUAR Aritar Bastet, CHARI z Esagilu. SARKO as far as his type is concerned is more similarly looking like his mother's father CHARI z Esagilu. 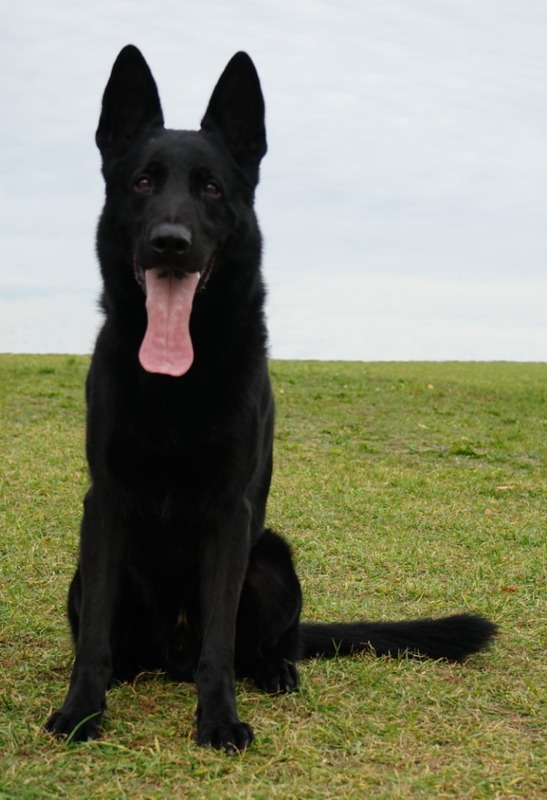 As far as his temperament is concerned SARKO is a dog with lots of energy that loves to do all the work and at the same time he is a dog that is absolutely problem free and has very pleasant temperament towards his handler. 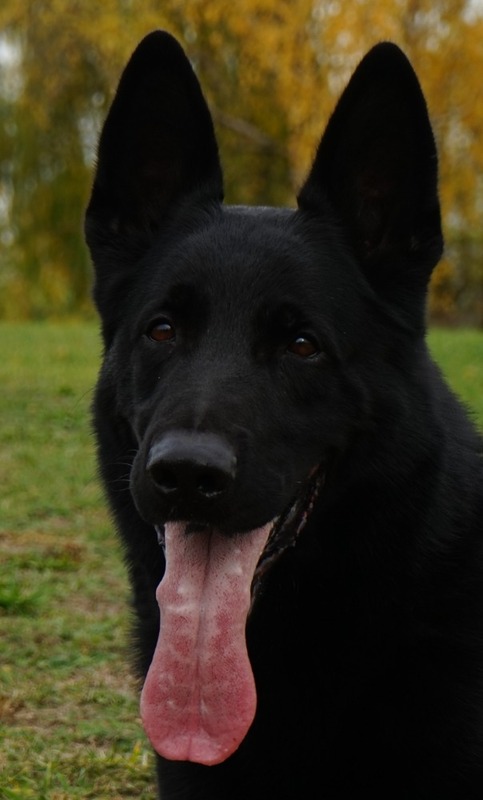 His training is done by elderly experienced trainer that manages to work with SARKO without any problems. 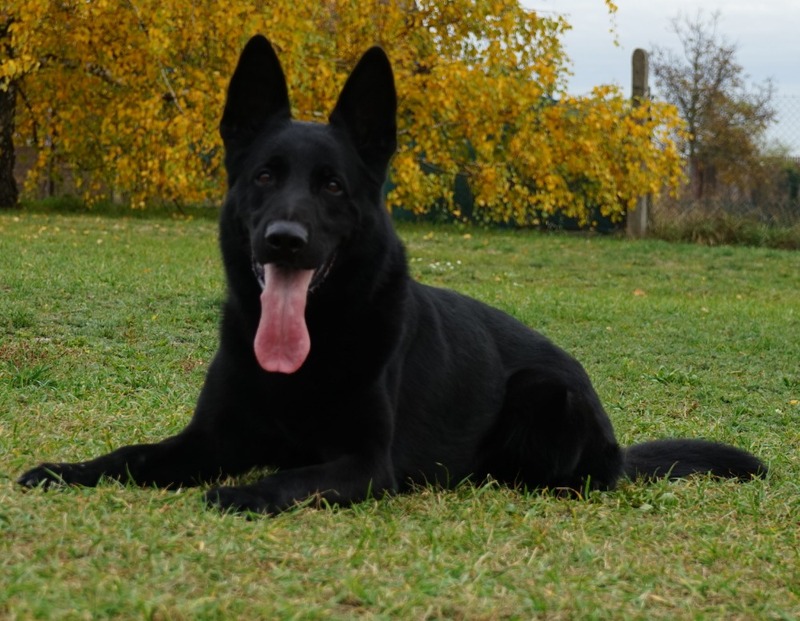 SARKO is suitable to be used everywhere where there is need to improve the body conformation, working traits and where there is need for calmer heads. 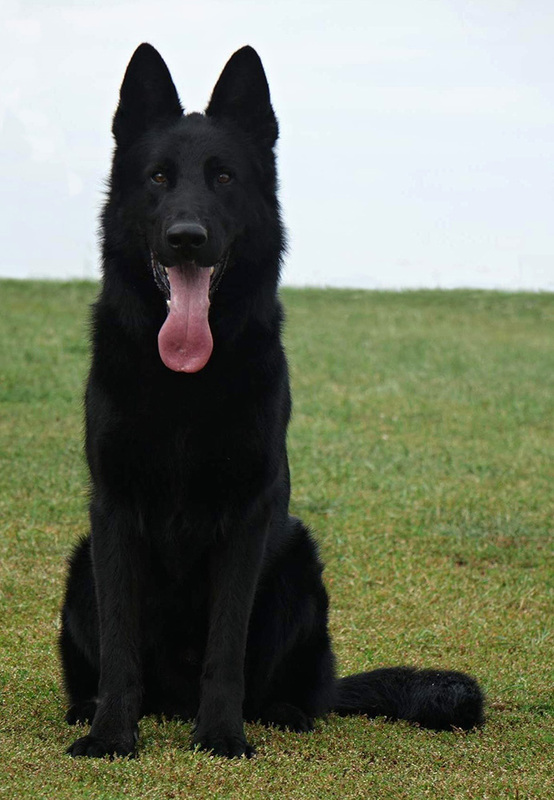 At the same time SARKO will improve health and black sable coloring of his progeny. 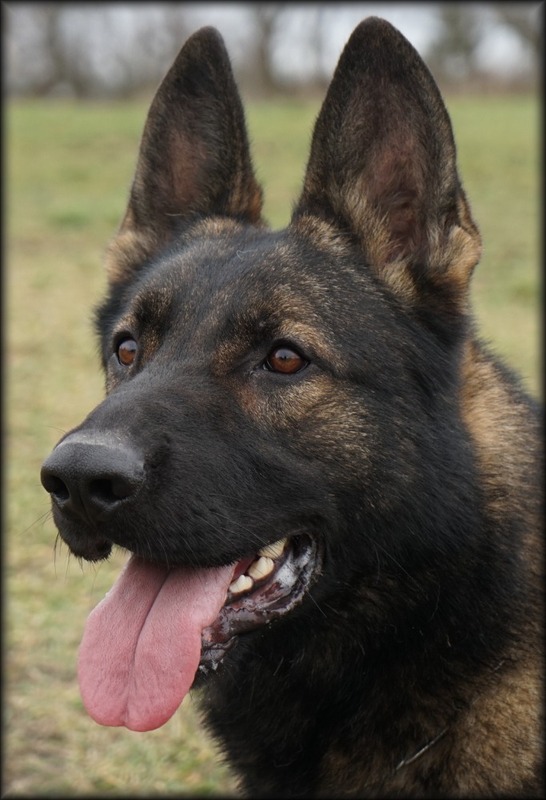 EIKO belongs from his sire's side (DANJO vom Lepperhof) to the 5th blood line namely to the working branch of former DDR. From her dam's side (JAZZ Birnejan) he belongs to the 3rd blood line also former DDR working branch. EIKO resembles fully the type of his father. 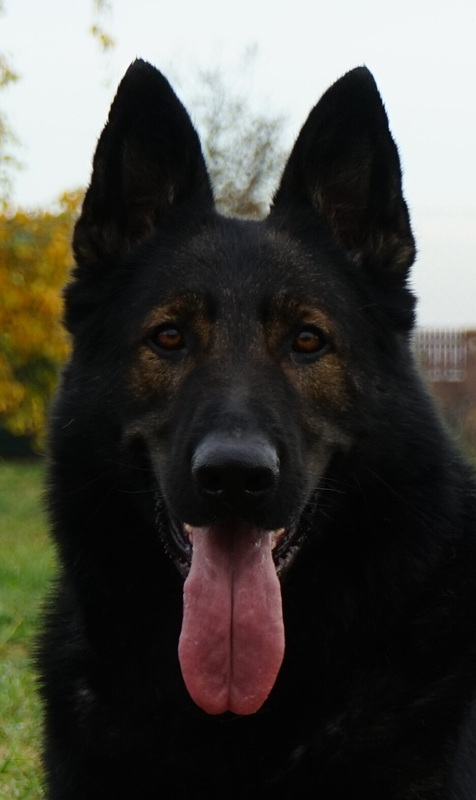 As for his temperament he is self confident male with strong prey, defence and play drives. EIKO is a passionate retriever and protection dog. He does obedience very fast with big passion. 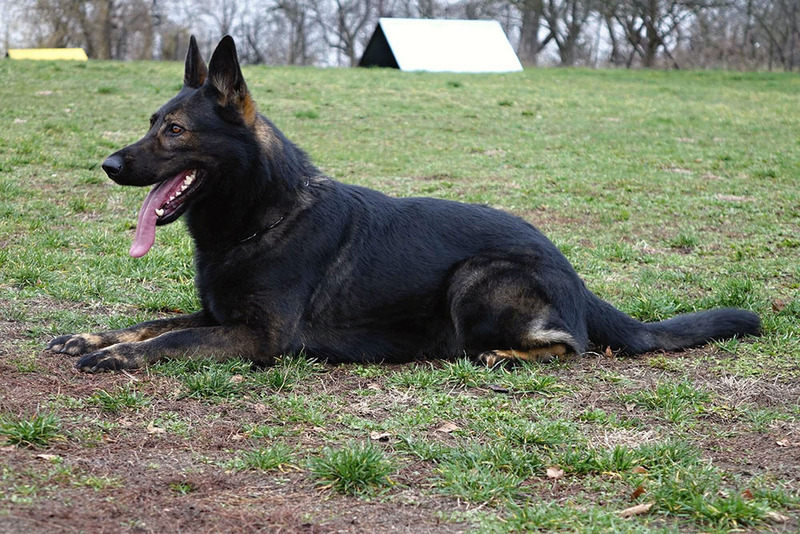 With frequent rewards with ball he becomes oblivious to the handler. EIKO has wide range of use. From law enforcement to personal protection to top sport. 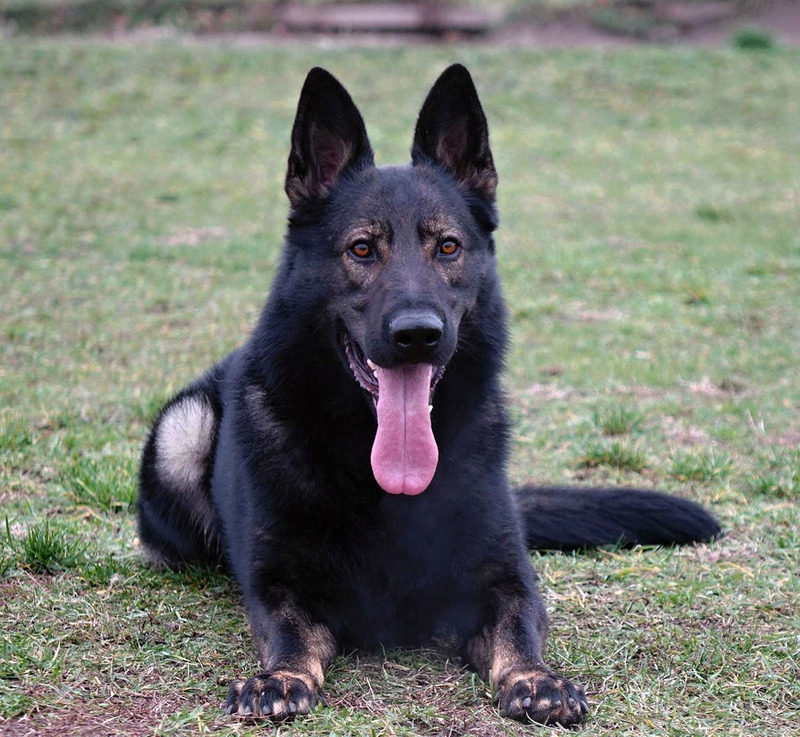 We believe that he will be frequently used stud dog. He is suitable to be used everywhere where there is need to improve energy level, willingness to work and also resistance to hander. 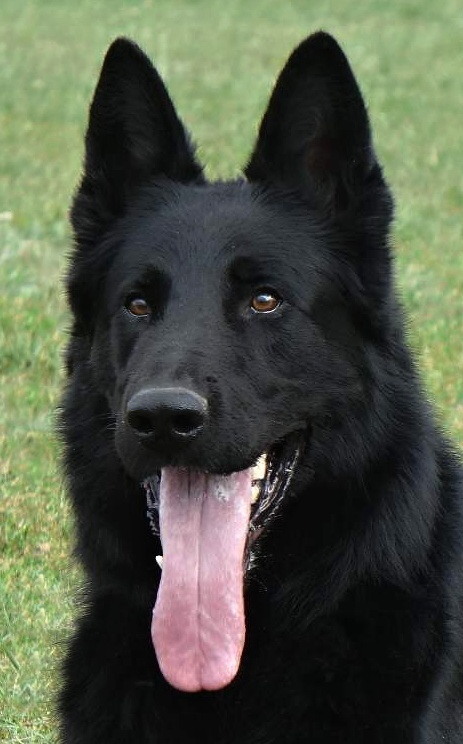 JACK DANIELS comes from 5th sire's blood line via his fatehr HON z Pohranicni straze (z PS), namely from the world renowned working branch of former DDR - ROLF Osnabrucker Land, X, ALLI vom Granert, X, DRUSSUS vom Falkenwappen, X, GEIER vom Baruther Land, BODO vom Winkel, CAESAR vom Ragental, BACK Samotar, EDY z Dunajova sadu , KLEN SNB, JEFF z Daskonu a HON z Pohranièní straze. 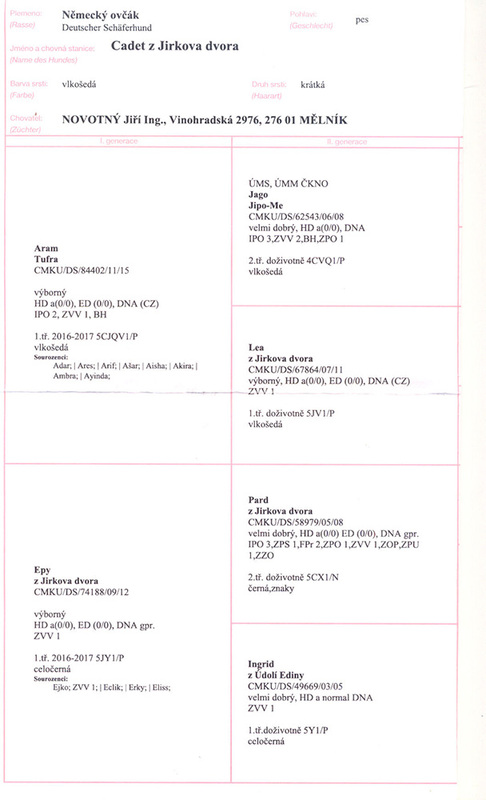 From his dam's line he's also carring blood of 5th blood line via his mother SAABA z Daskonu also namely from the world working branch of former DDR - ROLF Osnabrucker Land, X, ALLI vom Granert, X, BERO vom Krugers –Hof, BILL, vom Fasenhof , QUAX vom Haus Holland, INGO von Rudingen, X, X, ORRY von haus Antverpa, QERRY von haus Antverpa, TOM Vant Leefdalhof, ELLUTE v.d.Mohnwiese, BONGO Vikar a SAABA z Daskonu. 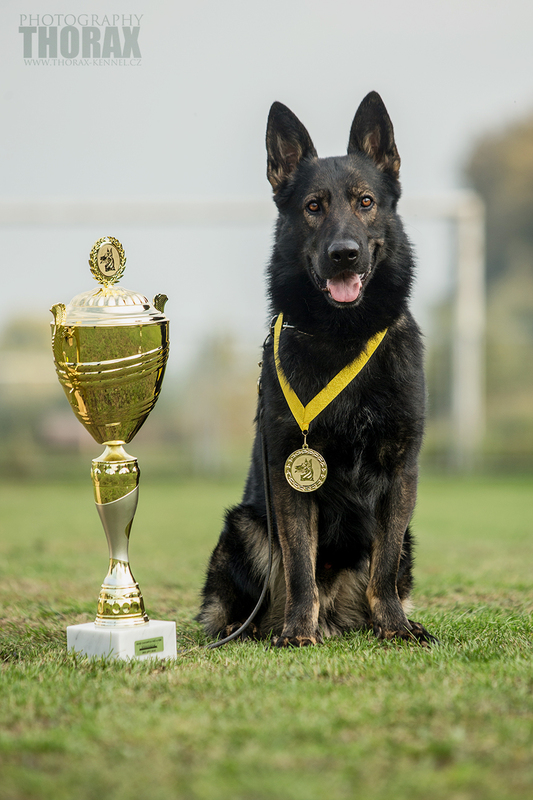 It is generally known that major part of these dogs has bene very succesful at the top national and international competitions. 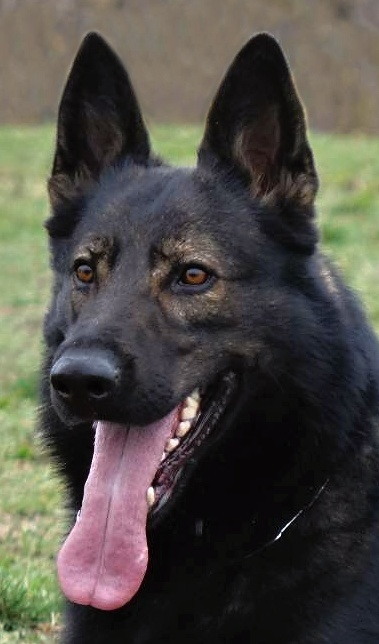 From his ancestors JACK received his intelligence level, great working drives to do any type of work with his handler with big endurance and tenacity with corresponding hardness and necessary health. For these precious traits he's been included into the breeding program of JINOPO. 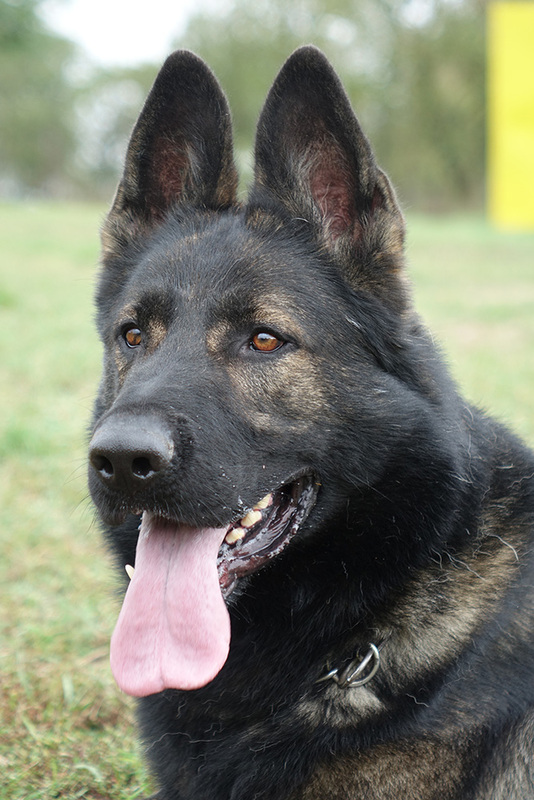 Because of his blood stability we expect that he will be a significant producer of healthy and hard working dogs. 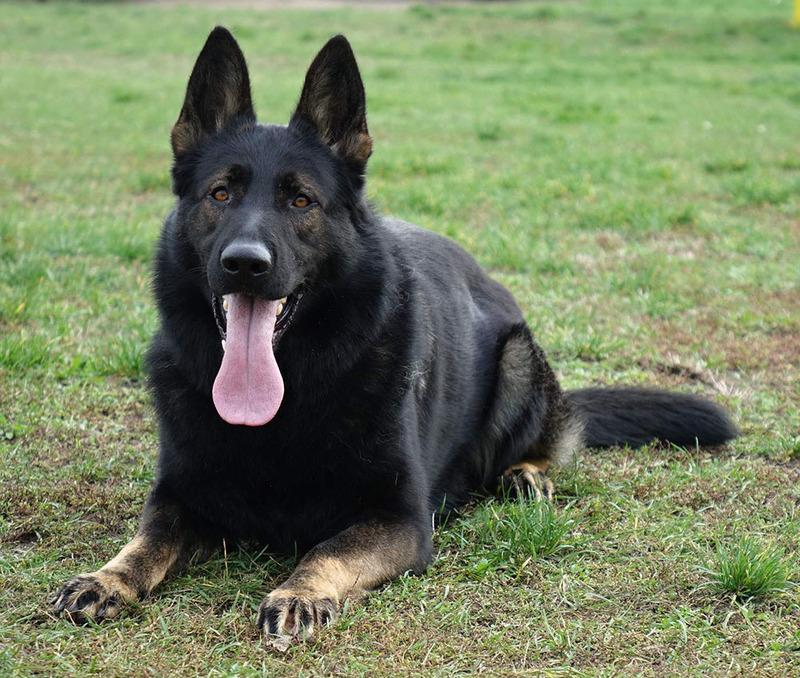 JACK is suitable to be used everywhere where the females are missing the above mentioned temperament traits and also to improve the pigmentation of coat, especially the yellow-red color marks. Where to locate us? Click here. Terms and Conditions | Print Bookmark this site! ..: © 1998 - 2019 Jinopo.CZ | German Shepherds :..